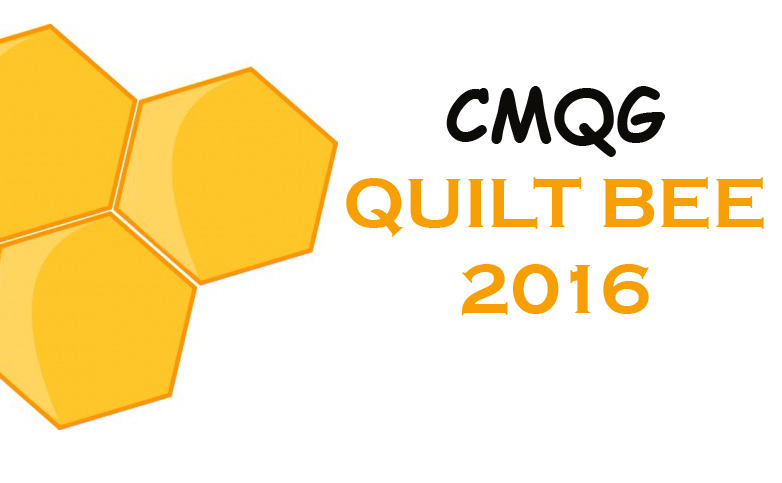 The final round of the first CMQG round robin/ traveling quilts sessions ended at the November meeting. Here all the blocks for each person's quilt were hung on a design wall for everyone to see. 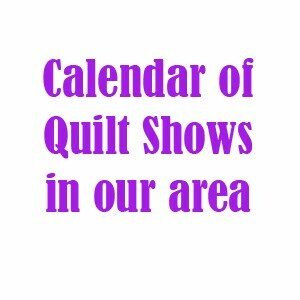 Note: You can sign up for the next round of round robin/ traveling quilts at the December meeting. 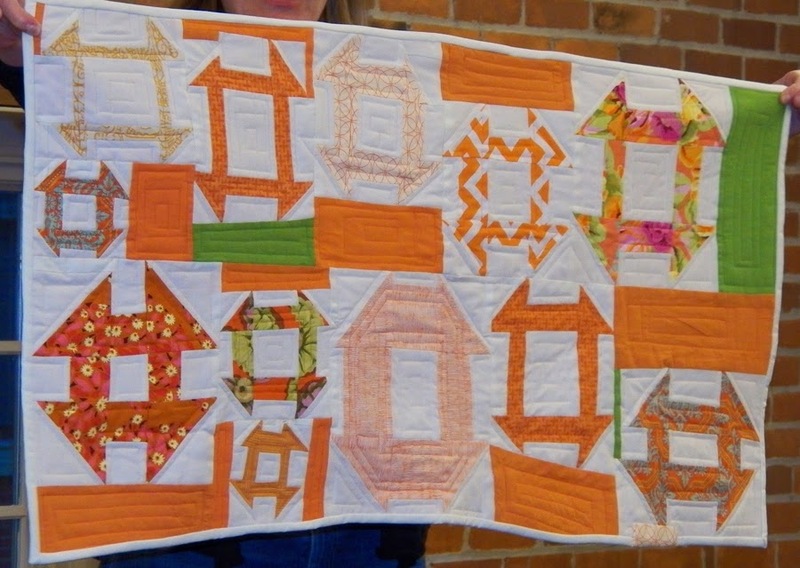 Then bring your first block and any fabrics you want others to include in their blocks for you to the January meeting. 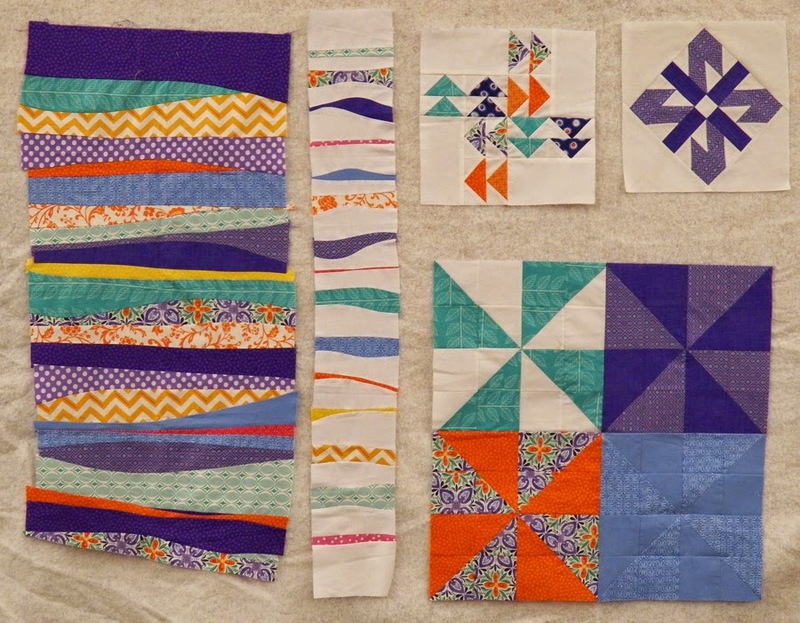 The blocks for Amy's modern sampler quilt. 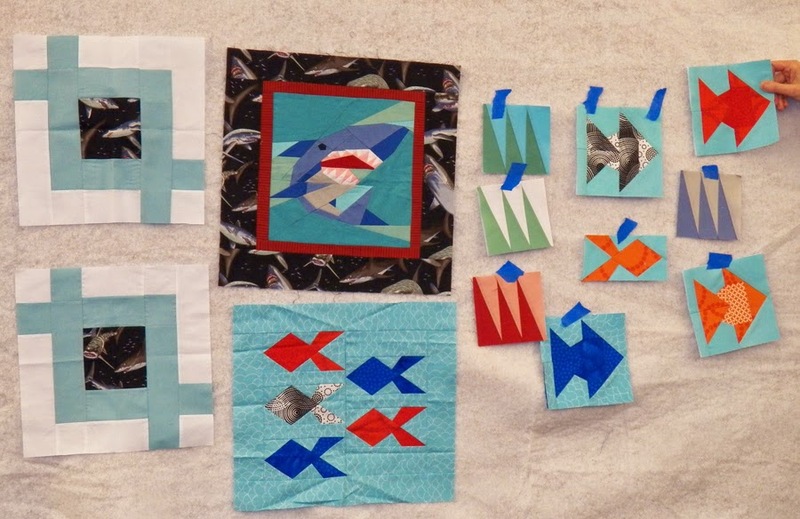 The blocks for Christine's shark quilt. 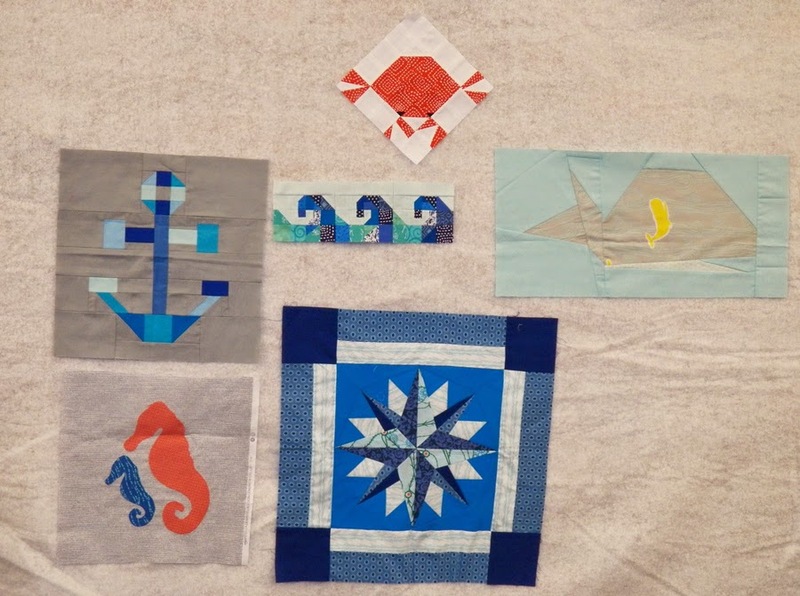 The blocks for Christy's nautical quilt. 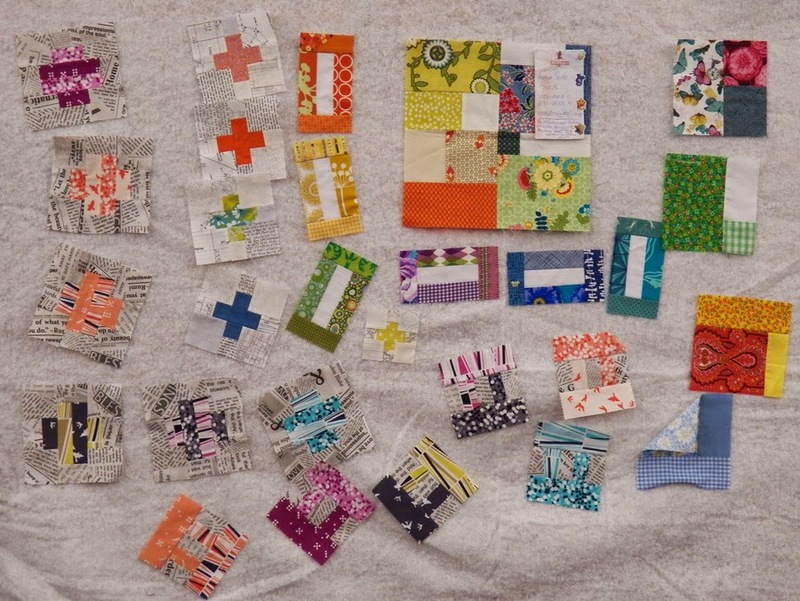 The blocks for Ellen's motion-themed quilt. 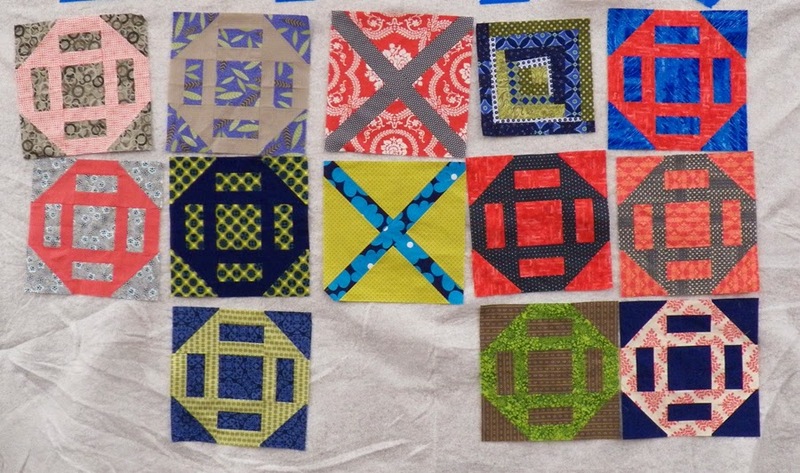 The sewn blocks for Gillian's low-volume quilt. The blocks for Janine's quilt. 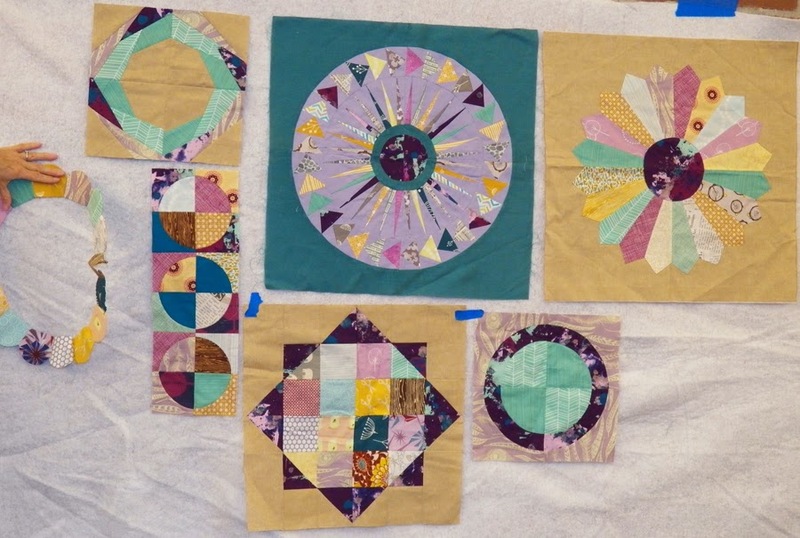 The blocks for Jessica's circle-themed quilt. 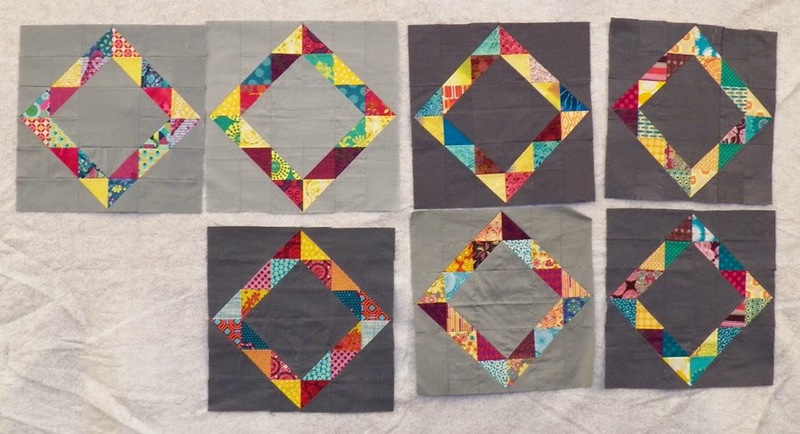 The blocks for Kathy's modern triangles quilt. 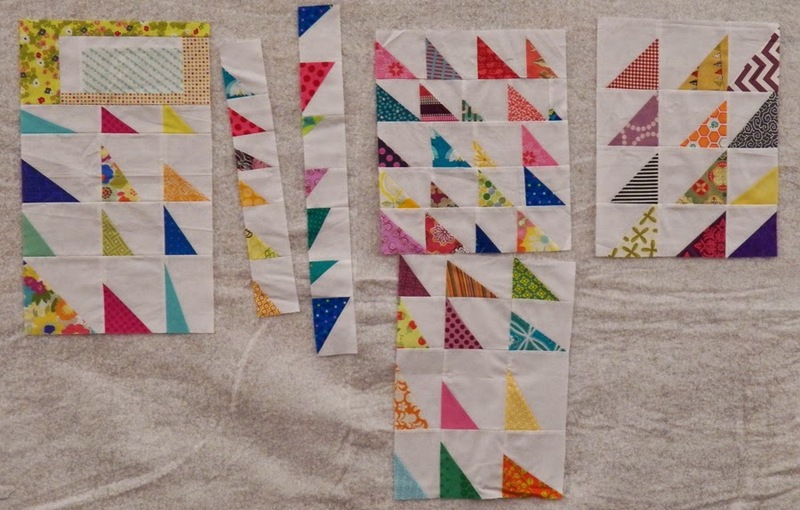 The blocks for Kay's flying geese quilt. 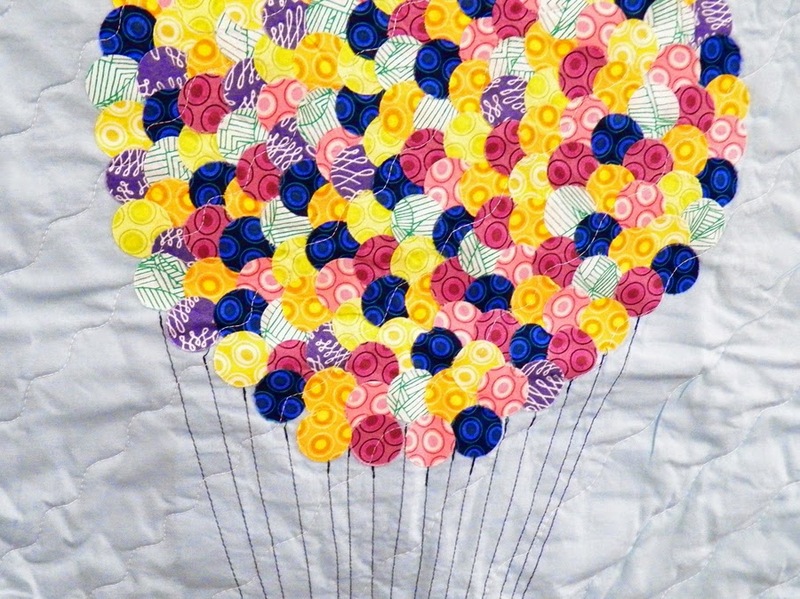 Detail of the newest block added to Kay's quilt. 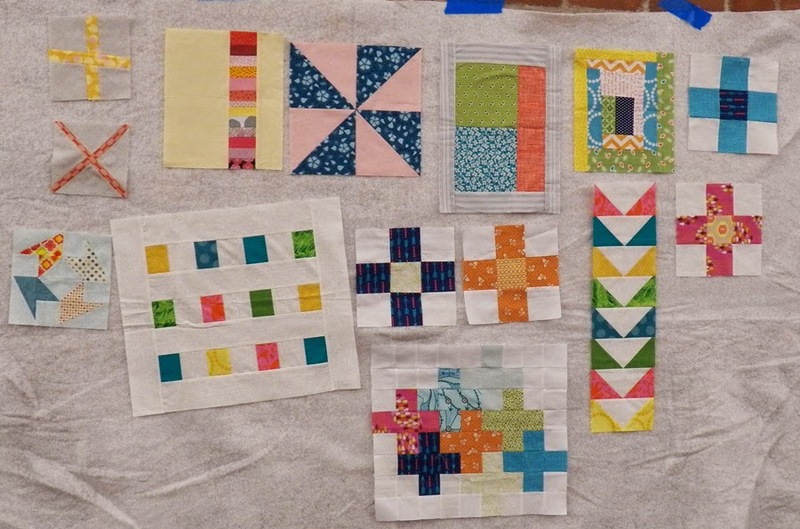 The blocks for Kayla's house quilt. The blocks for Kim's mini-quilt-block quilt. The blocks for Michelle's quilt. 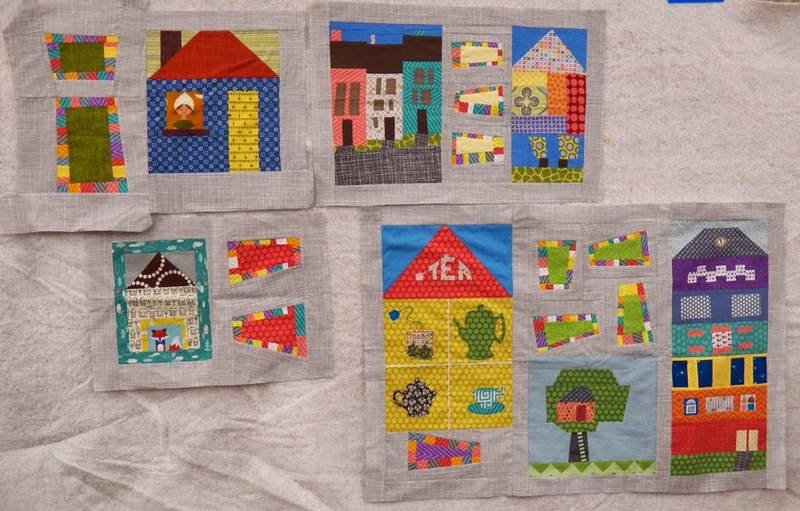 The many pieces for Teresa's quilt. Guild Elections: Start thinking about running for CMQG offices. Let Michelle know if you're running by the January meeting. Elections will be at the February meeting. New officers start at the March meeting. The officers we elect each year are president, vice president, secretary, treasurer, and member-at-large. 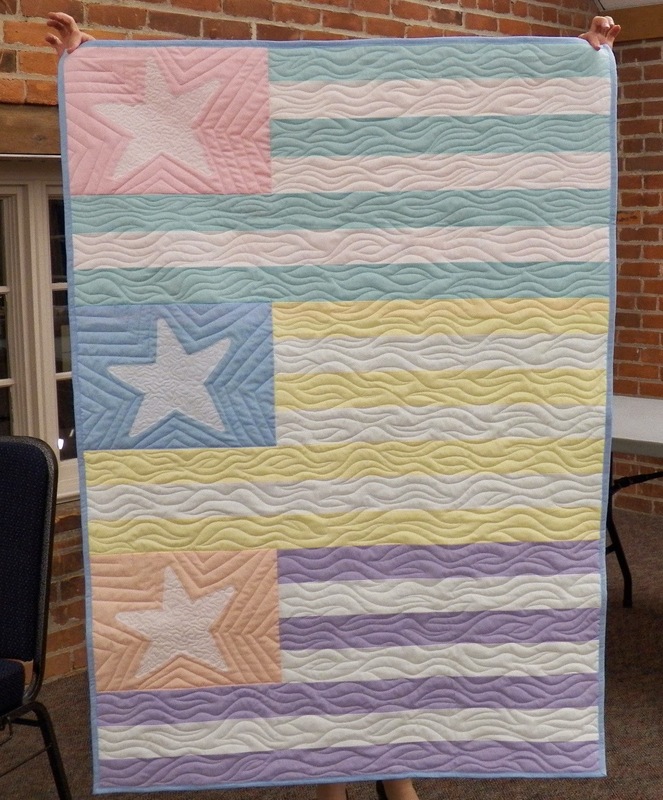 Next Round Robin/ Traveling Quilt Session: Sign up for the next round robin/ traveling quilt session at the December meeting. 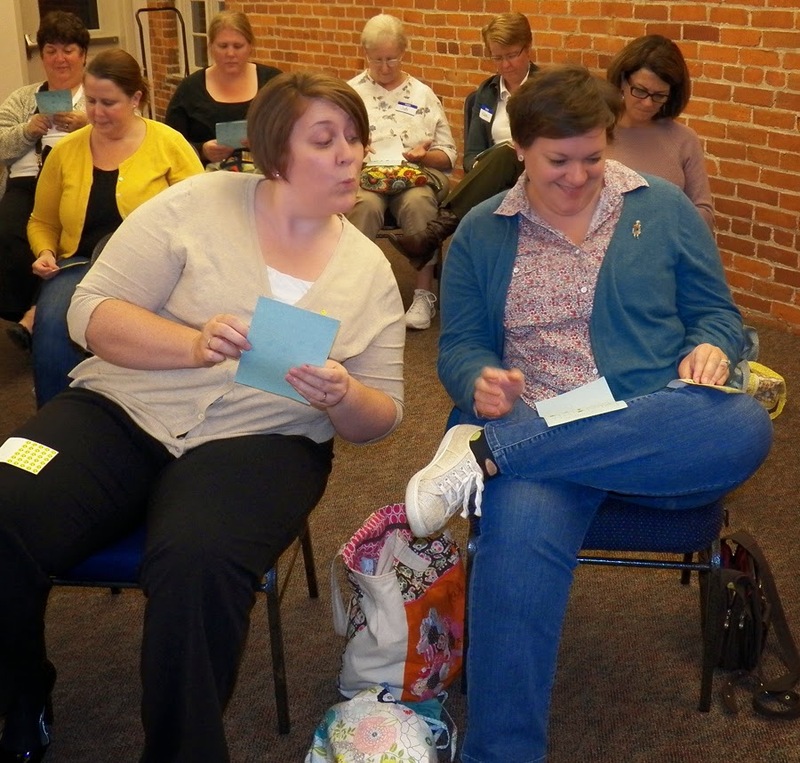 Then bring your starter block (and any fabrics you'd like the other members of your group to use) to the January meeting to kick off the fun. 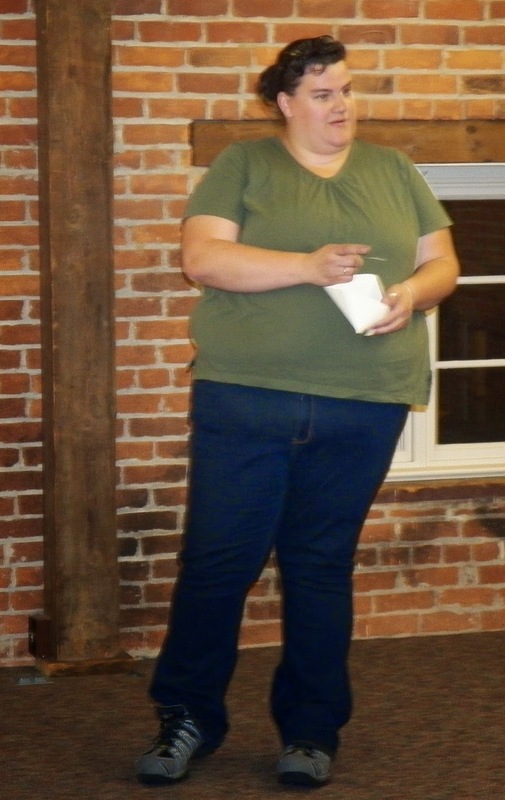 December Meeting: This meeting will be a potluck dinner. Bring the food item for which you signed up, or if you didn't get a chance to sign up, bring your favorite dish to pass. Also, if you signed up for the holiday swap, bring the gift for the person to whom you were assigned. 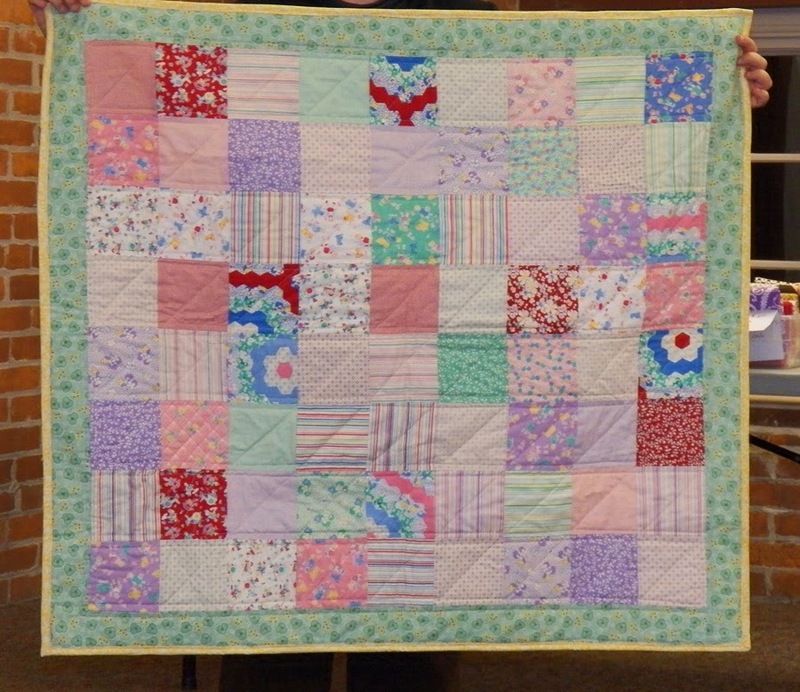 A baby quilt Annie made. 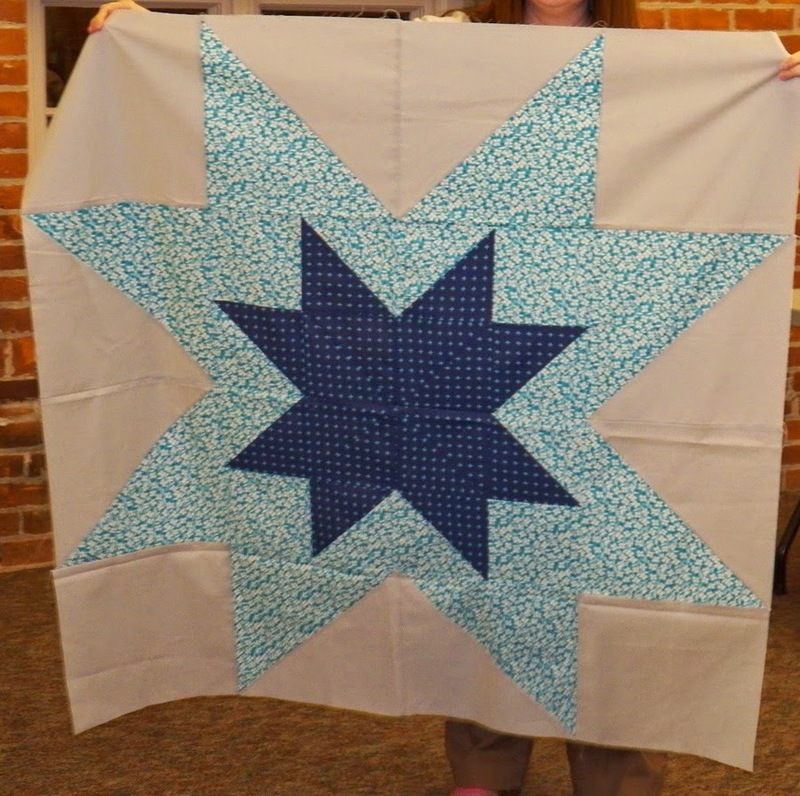 Quilt Annie made for a St. Ursala student. 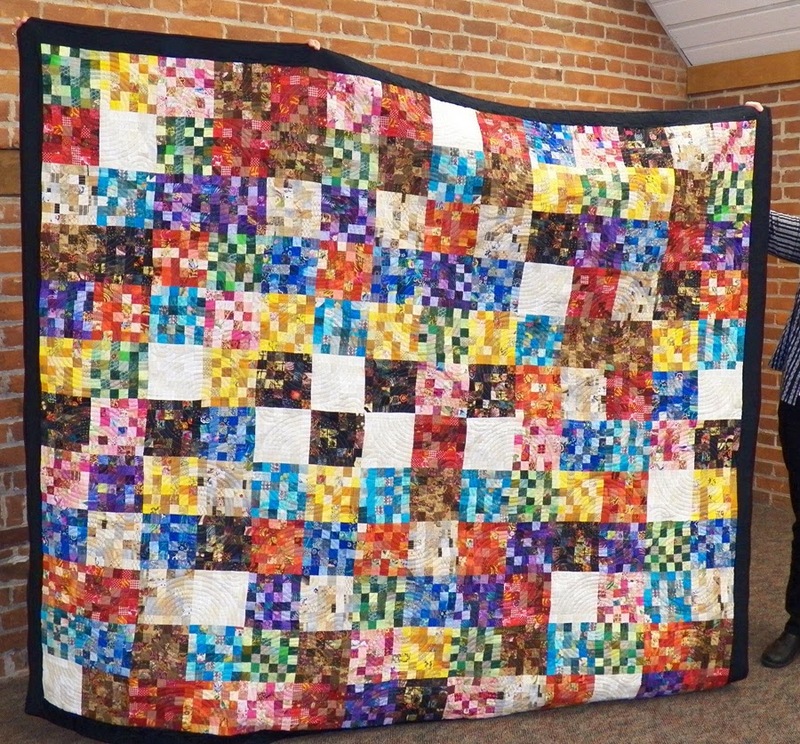 Coordinating quilt Annie made for another St. Ursala student, the sister to the first. 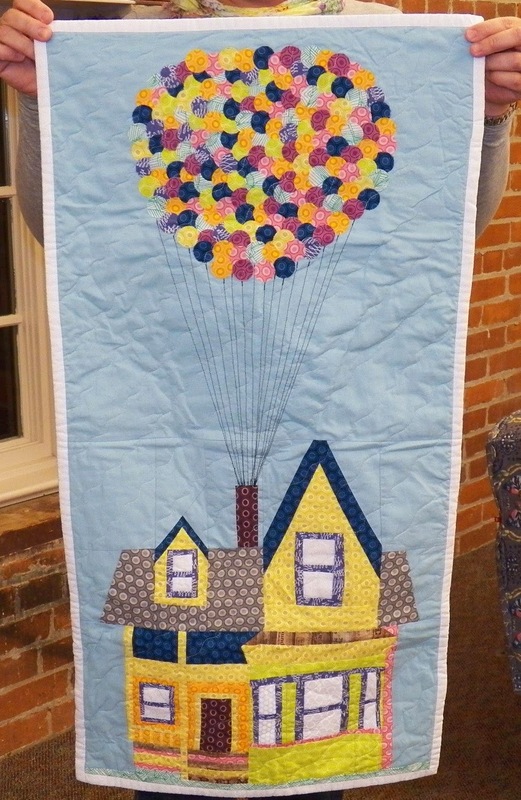 A wall hanging Annie made based on the movie Up for a friend's new baby whose nursery is Disney themed. 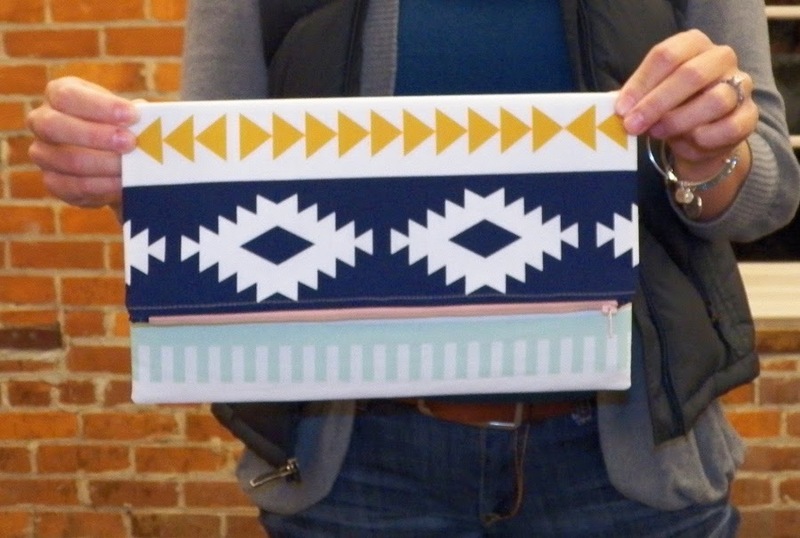 A foldover clutch Abby made. Family reunion quilt that Kim made. It's been passed through the family via white elephant auctions. Charity quilt Shonna started at the October sew-in and finished at home. 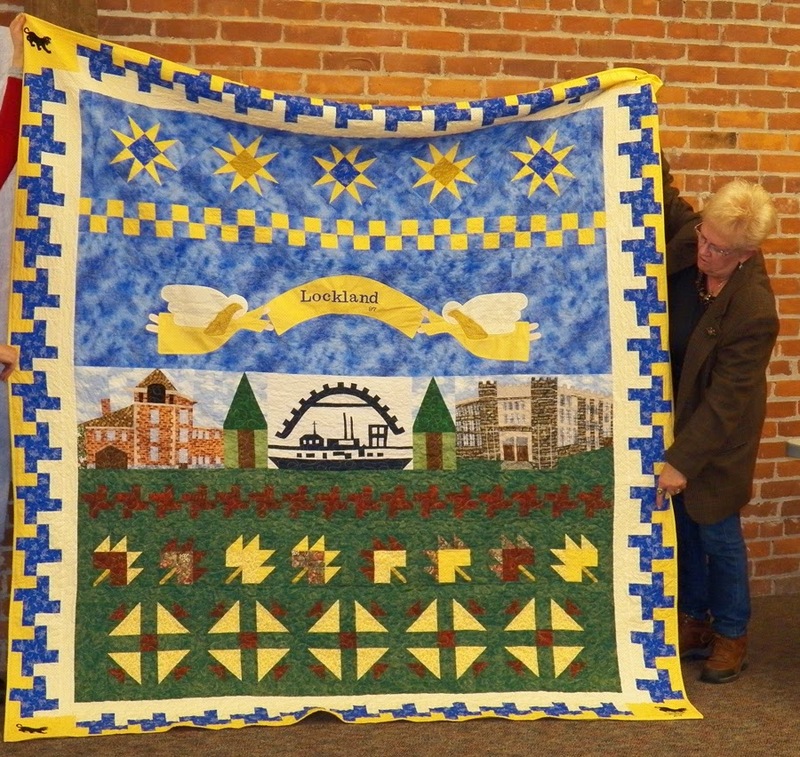 Quilt Ruth made in honor of her hometown of Lockland, Ohio. 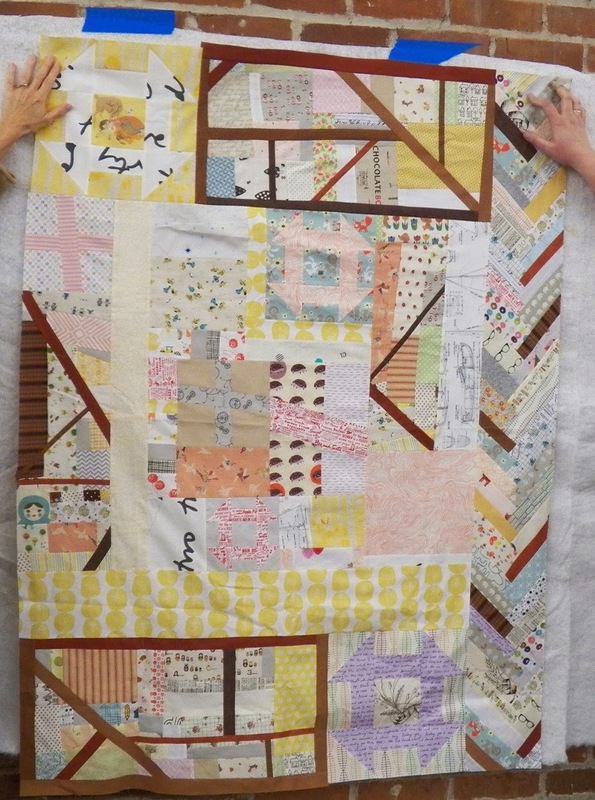 In the making of this quilt, she learned that sewing buildings that look like buildings is kind of hard. 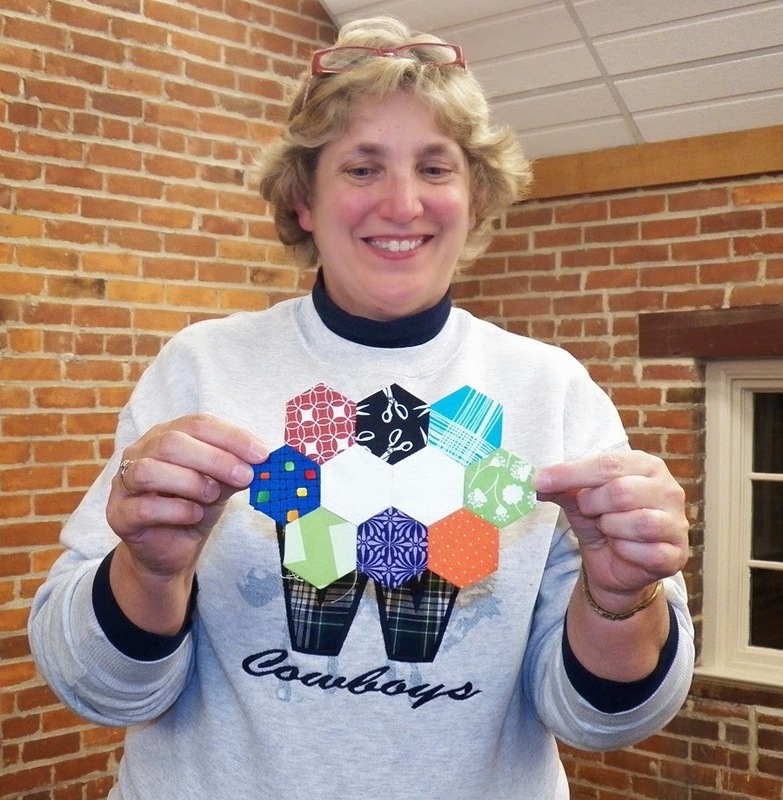 Carole's been working on her hexie challenge project. 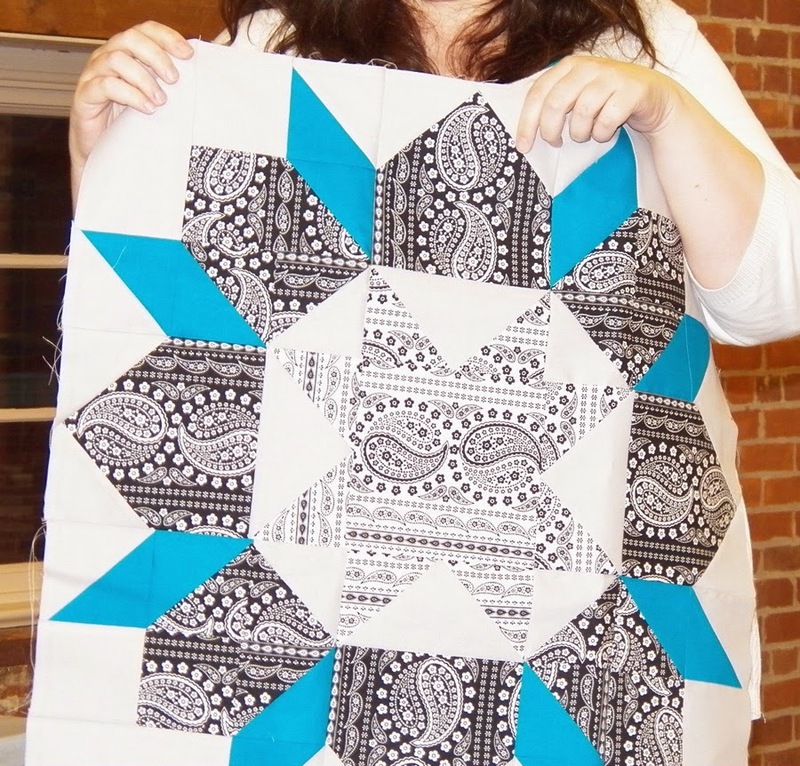 Lesley made this quilt with aboriginal fabrics and a clean design. 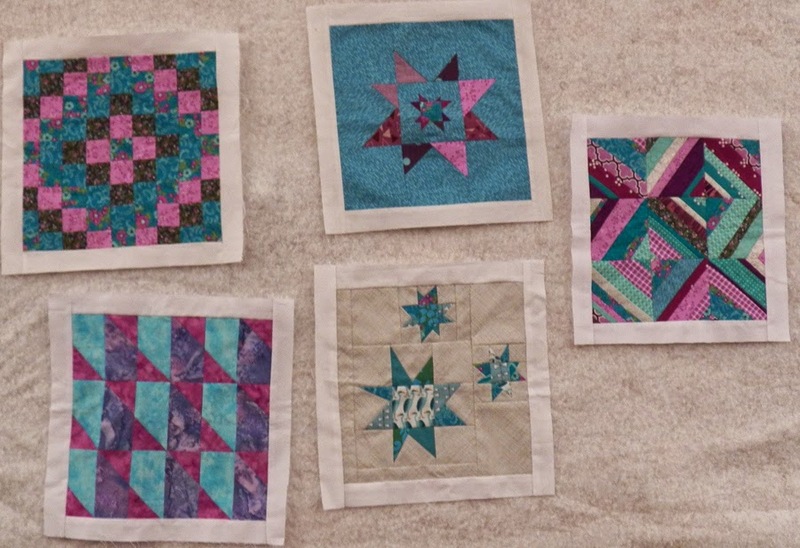 Pam finished a few more Swoon blocks for her quilt. She's not sure if the pink one will make the cut, though. 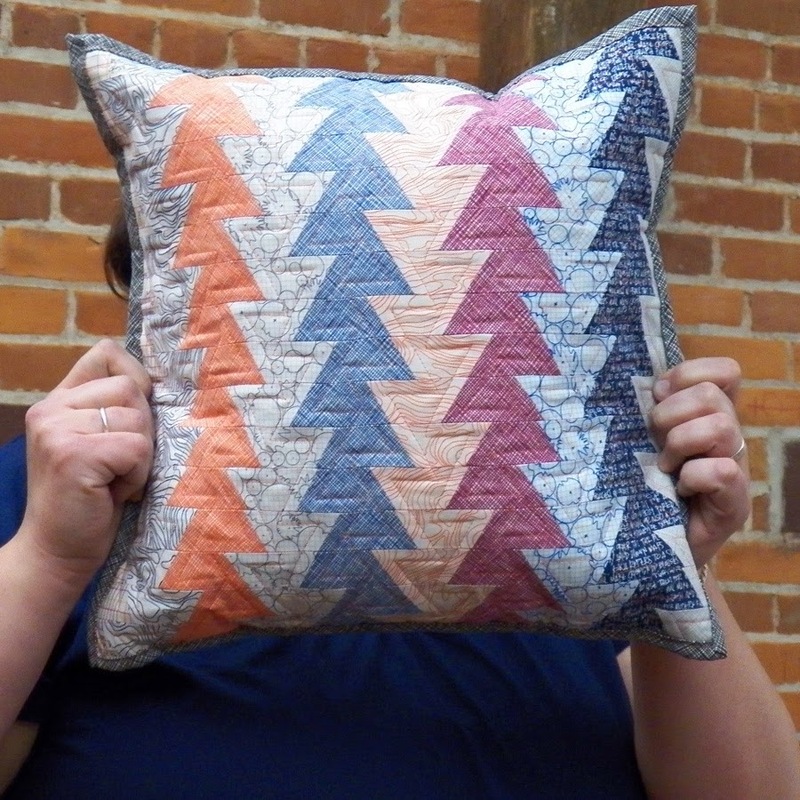 Pillow Brooke made using a Jaybird pattern. 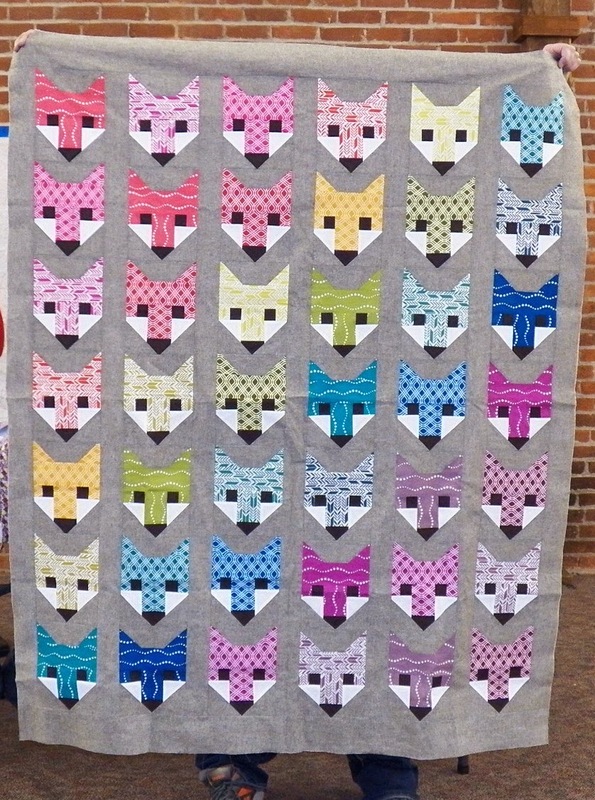 Brooke's adorable fox quilt made from an Elizabeth Hartman pattern. Wendy's pinwheel quilt made with zombie fabrics. 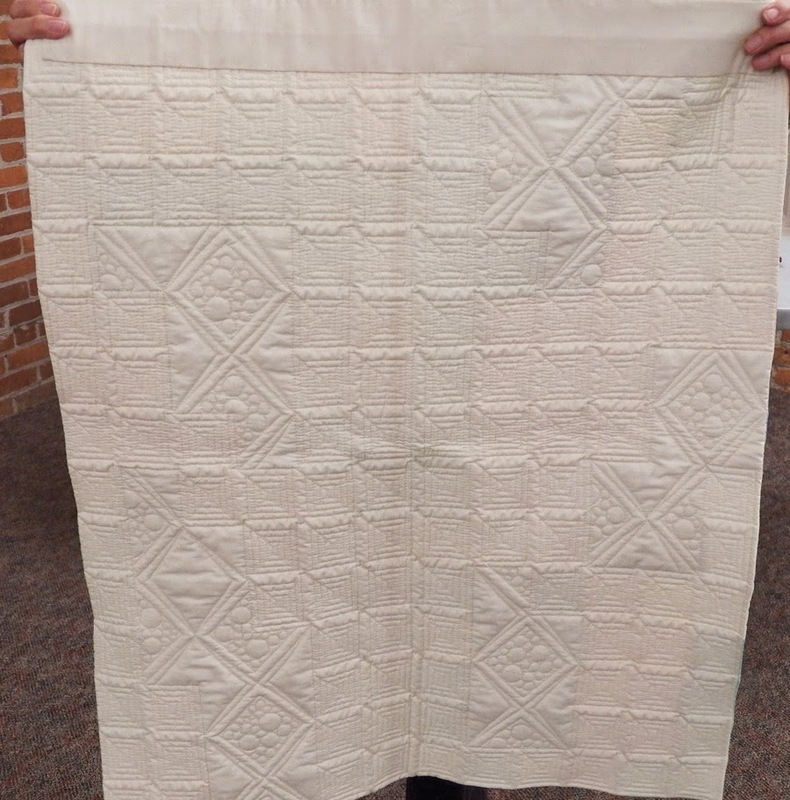 Jill did the quilting with a spiderweb motif. 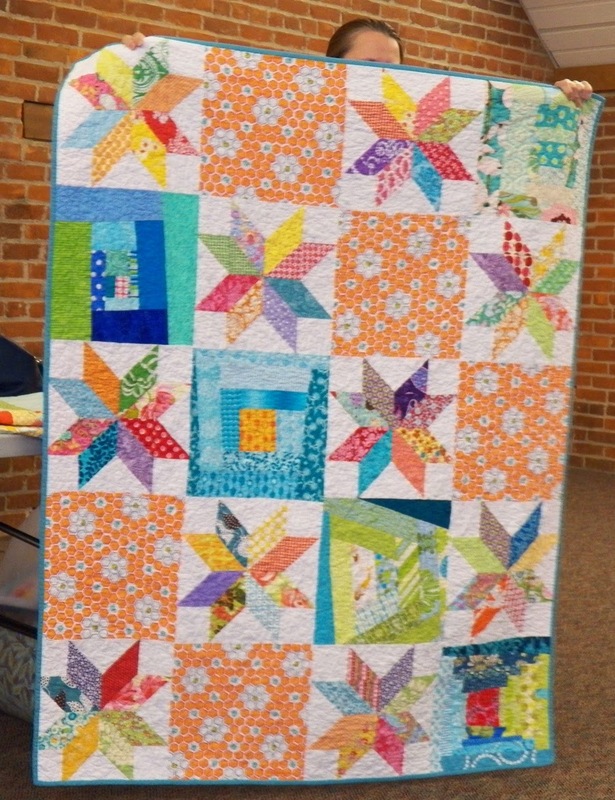 Heather's improv pineapple quilt that she made with about 80 different colors of fabric. Christine's lattice quilt top that has some stretching issues due to fabrics cut on the bias. 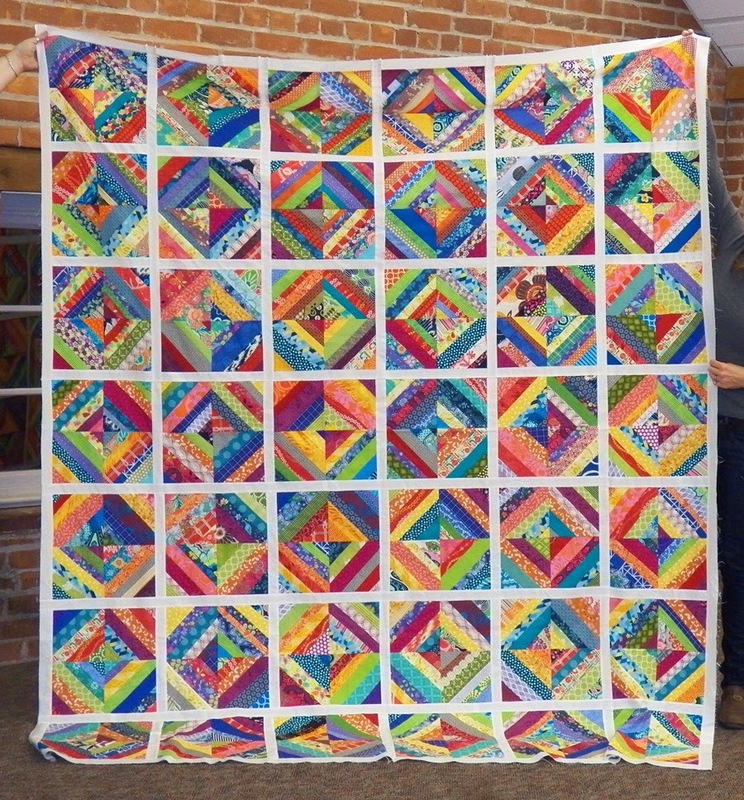 A quilt Amy is making to give as a wedding gift. 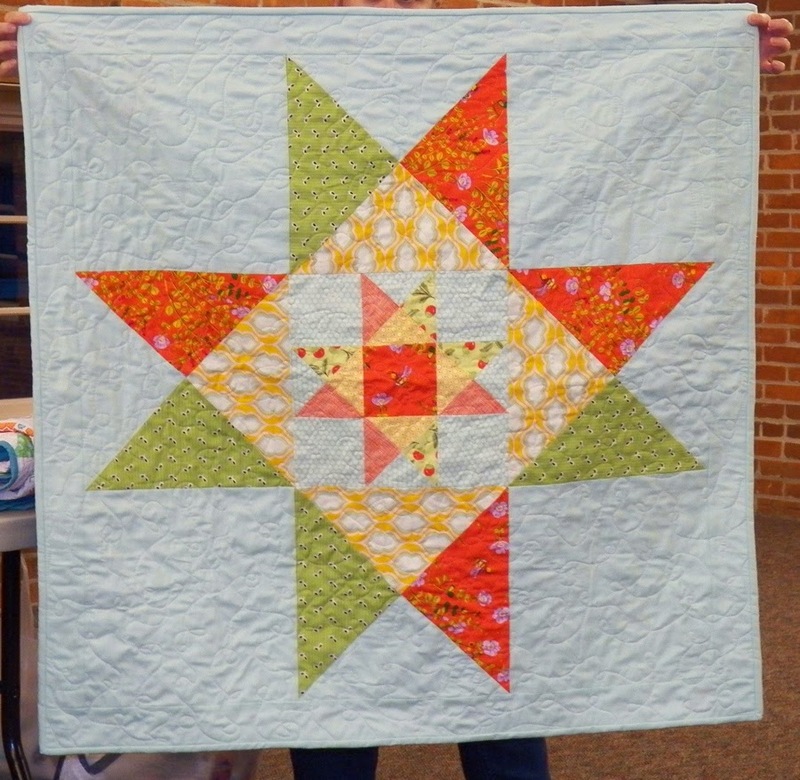 A charity quilt Michelle quilted on Ellen's longarm machine. Michelle used the cheater binding technique (where you fold the backing forward to make the binding), but she found it harder and more time-consuming than a regular sewn on binding. 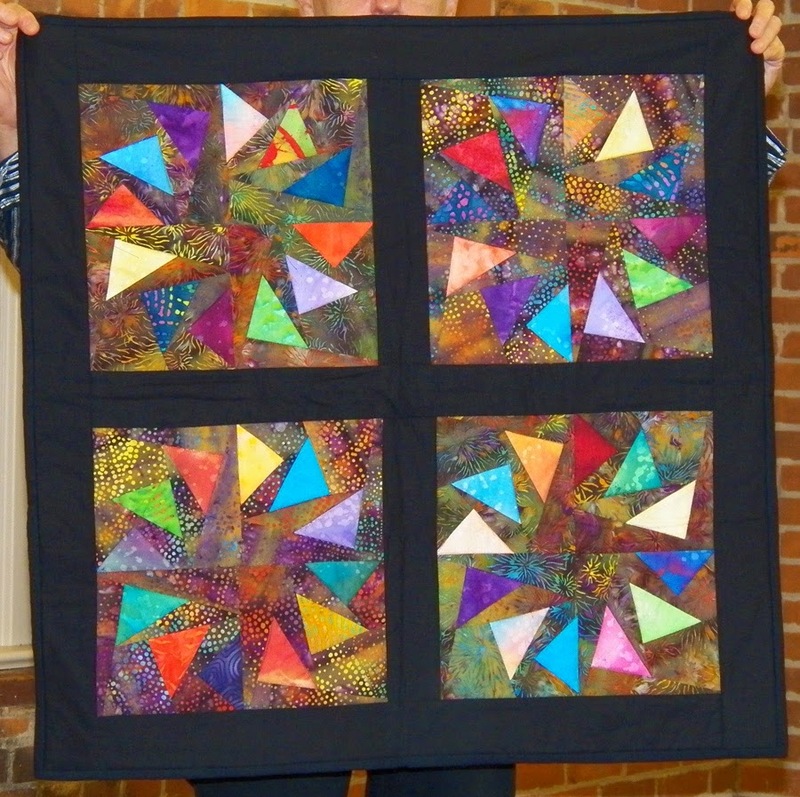 Janine's Micheal Miller pastel challenge quilt. 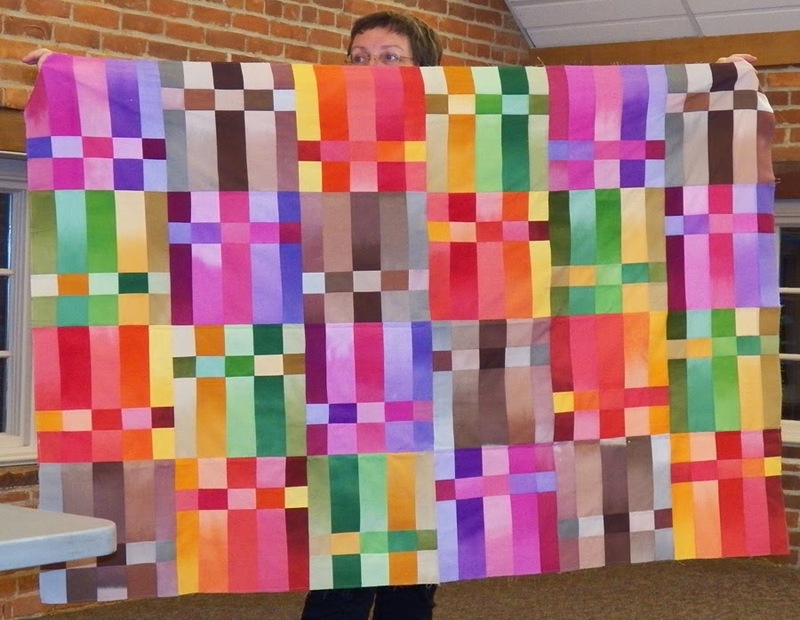 Her goal was to make a modern quilt using the challenge fabrics. 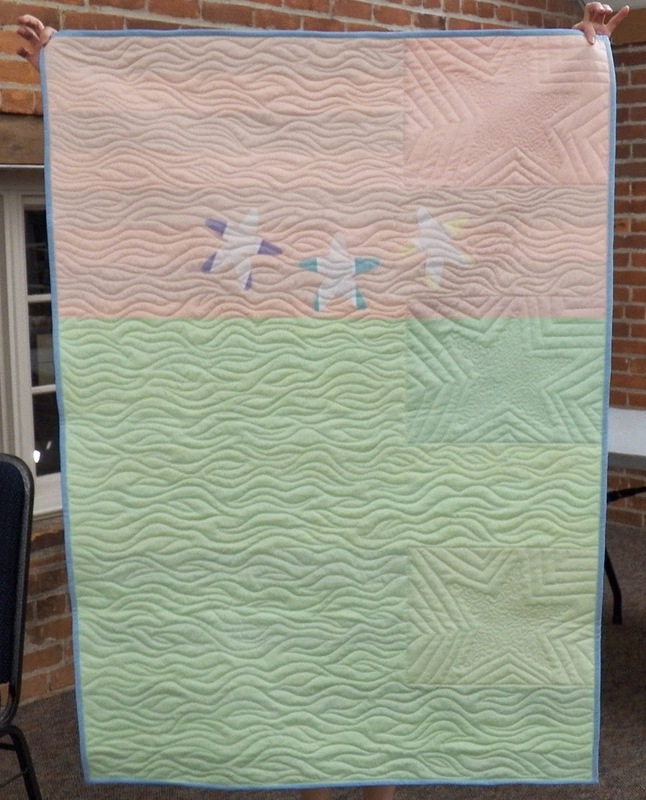 Carole's Michael Miller pastel challenge quilt. 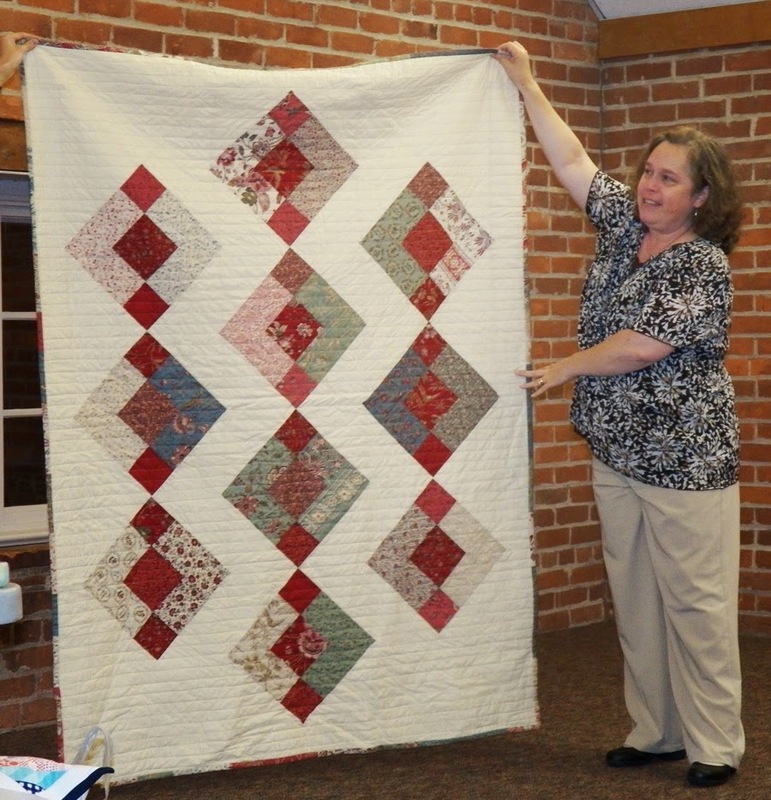 She used two layers of batting to achieve the very raised parts of the quilting. 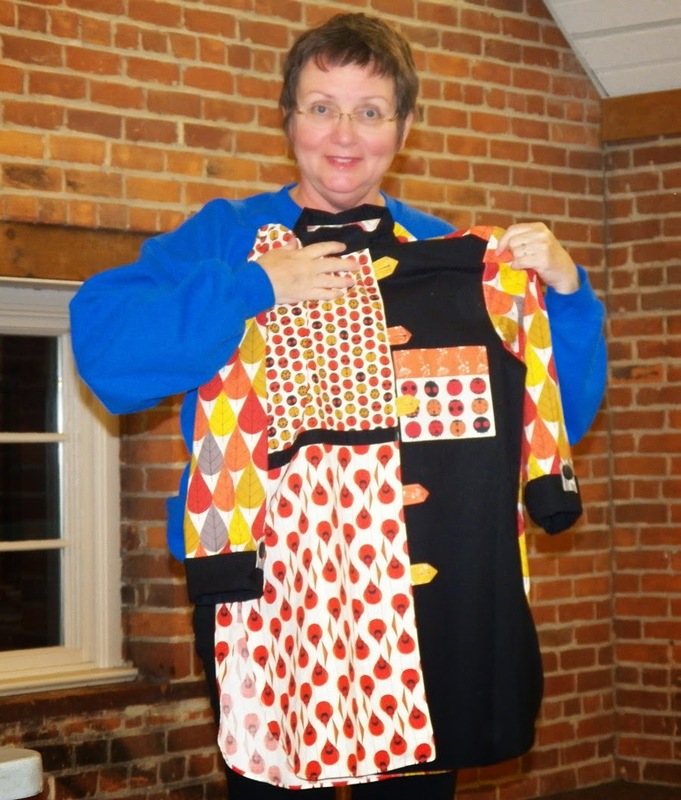 "The bottom line is, we are the Cincinnati Modern Quilt Guild. There were other guilds in town when this baby was created, so it was created with a specific purpose to serve a particular group. 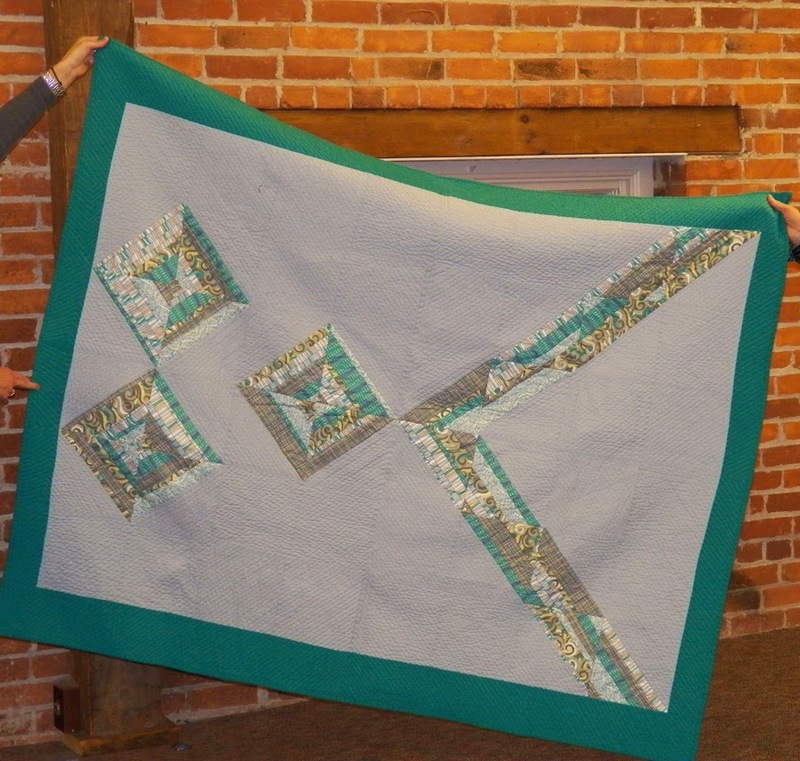 It's not just another local quilting guild. 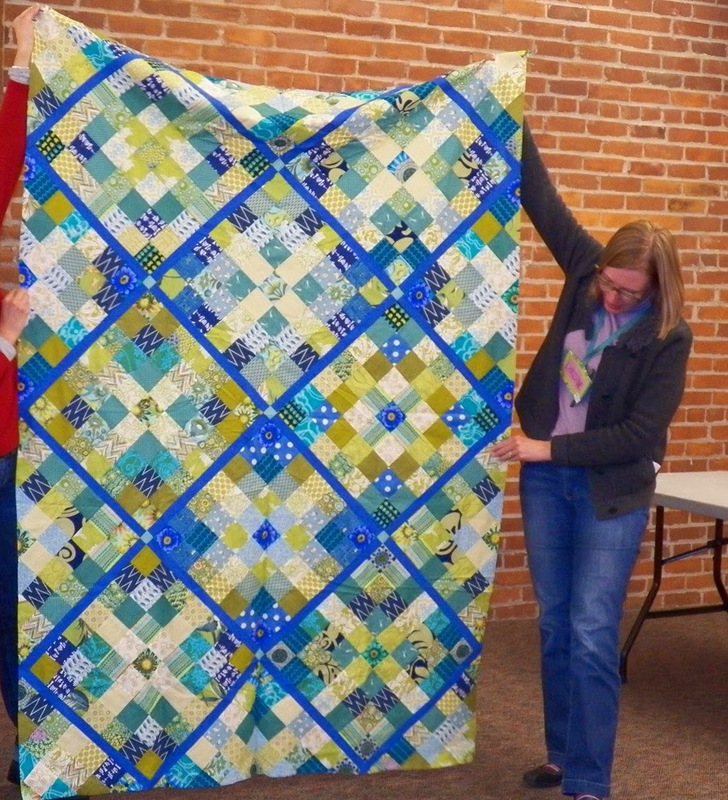 It's a modern quilting guild. "We want to inspire people with the modern aesthetic that most people joined this group to see, to learn from and to experience. 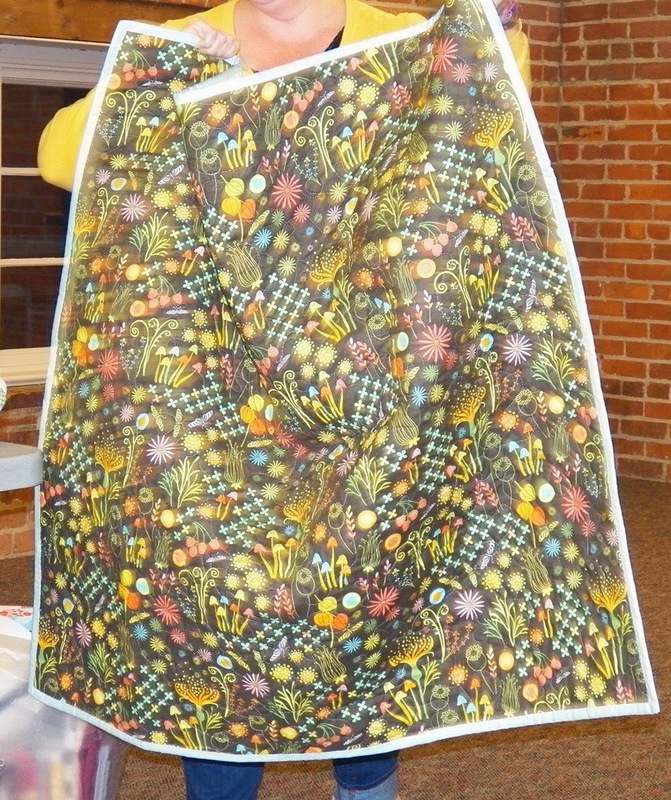 You should come to the modern quilt guild to show modern works. Someone gave a great example last night in that you go to the Museum of Modern Art expecting to see modern art. Our Guild is no different." 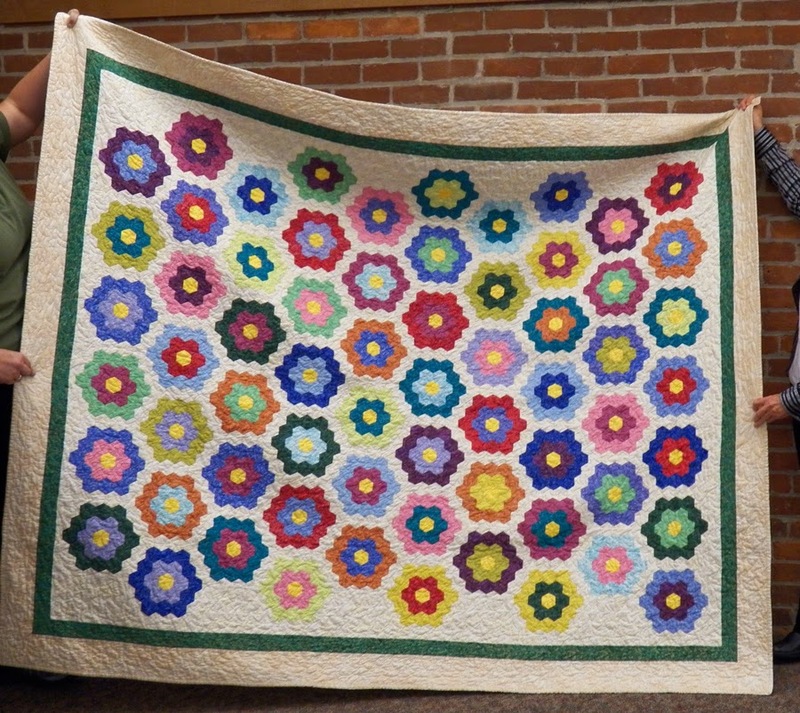 "Thank you for helping us hone in on recapturing what this guild is intended to be....the Cincinnati Modern Quilt Guild." Mini Maker Faire: This event went very well with a lot of people stopping by to learn more about the guild. We also got a few new Facebook followers as a result of the event. 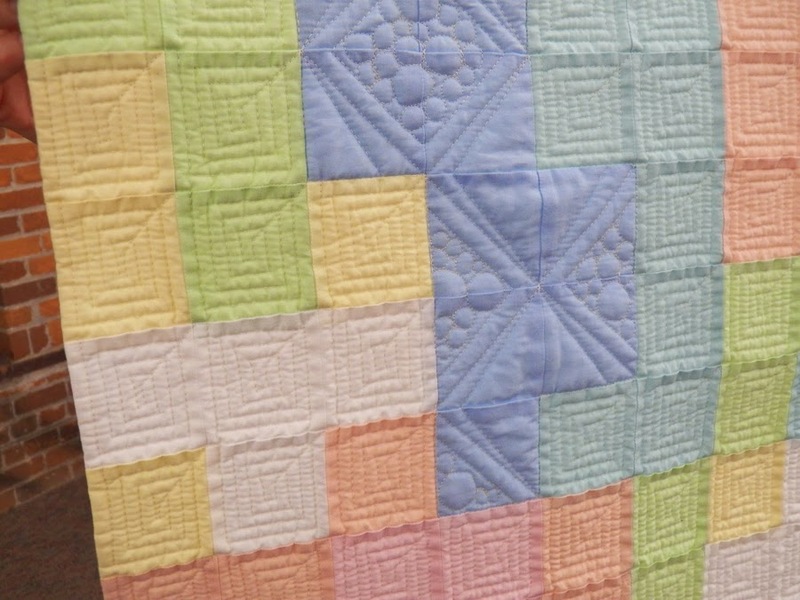 National Guild Renewal: The annual renewal for the national Modern Quilt Guild is coming up, so we've cleaned up the e-mail list to reflect paid members only. If you have not received an e-mail regarding the October or November meetings, we do not have you listed as a paid guild member. See Michelle or Christy for more information. 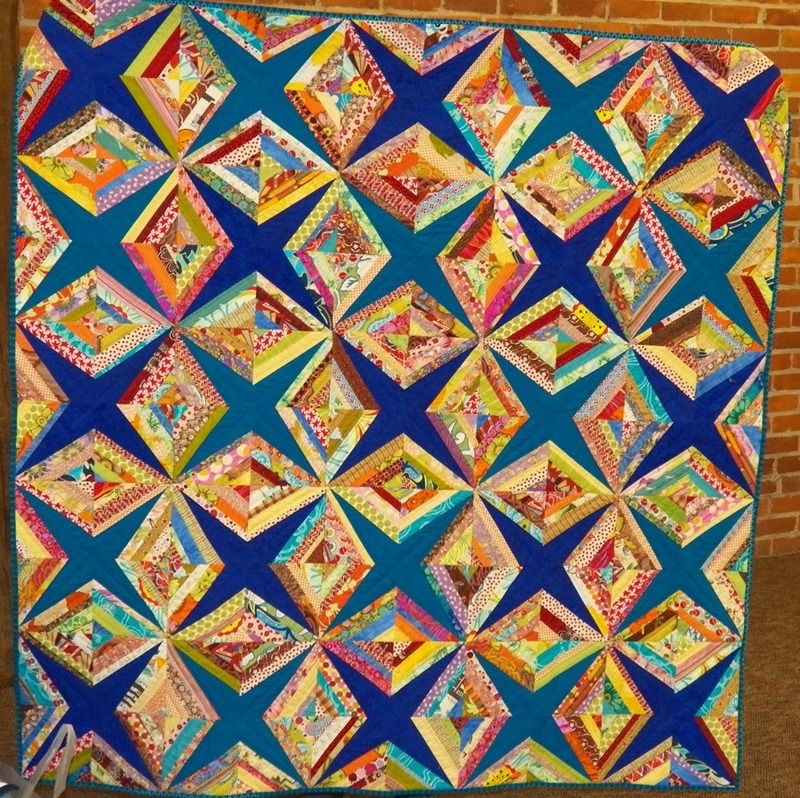 Charity Quilts: So far, the guild has completed eight quilt tops for charity. The guild will be purchasing solid fabric for backs. 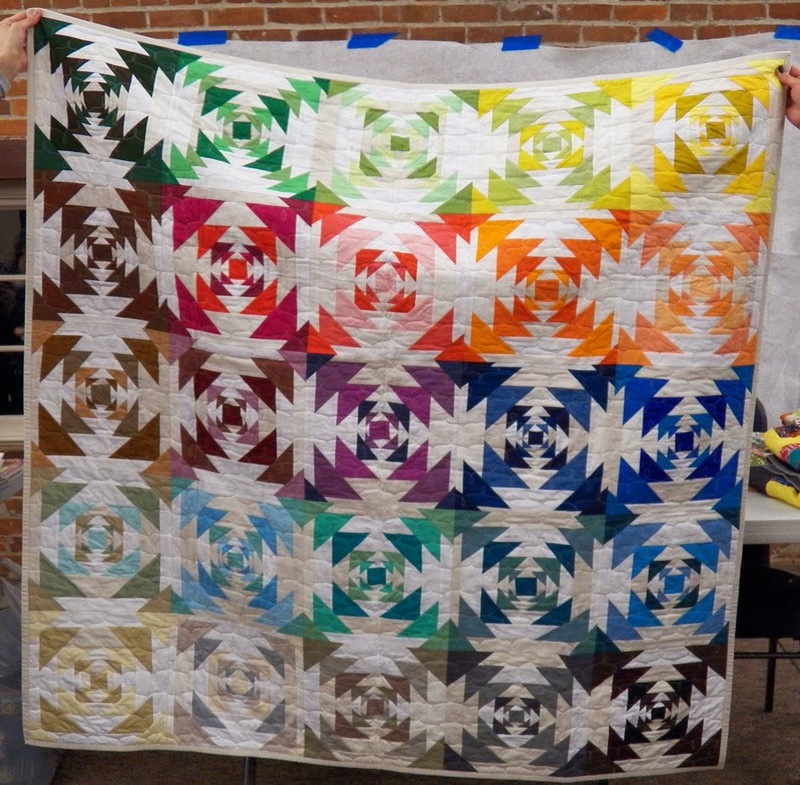 We have volunteers to quilt some of the tops, including Harriet, Leslie, Christine, and Michelle. 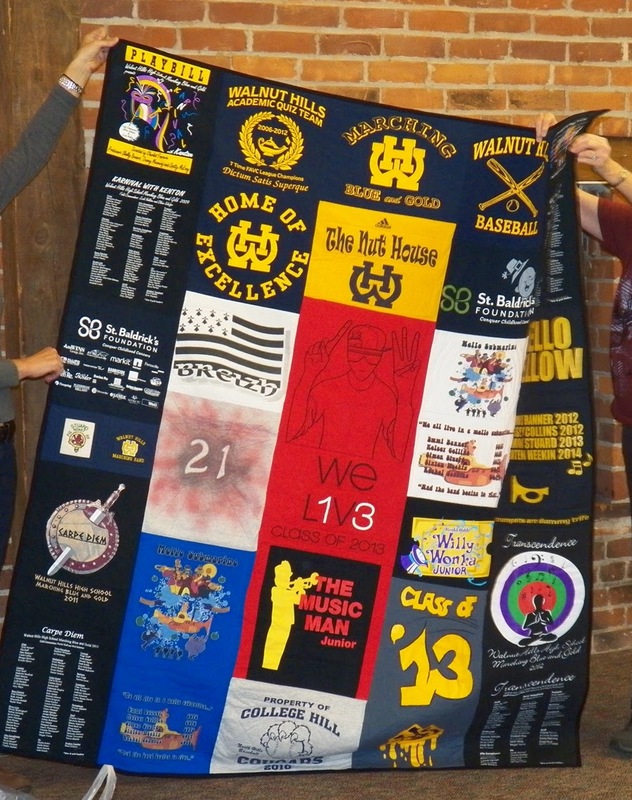 All the quilts we have complete by the November meeting will be donated to the Veterans Hospital of Cincinnati and Northern Kentucky. 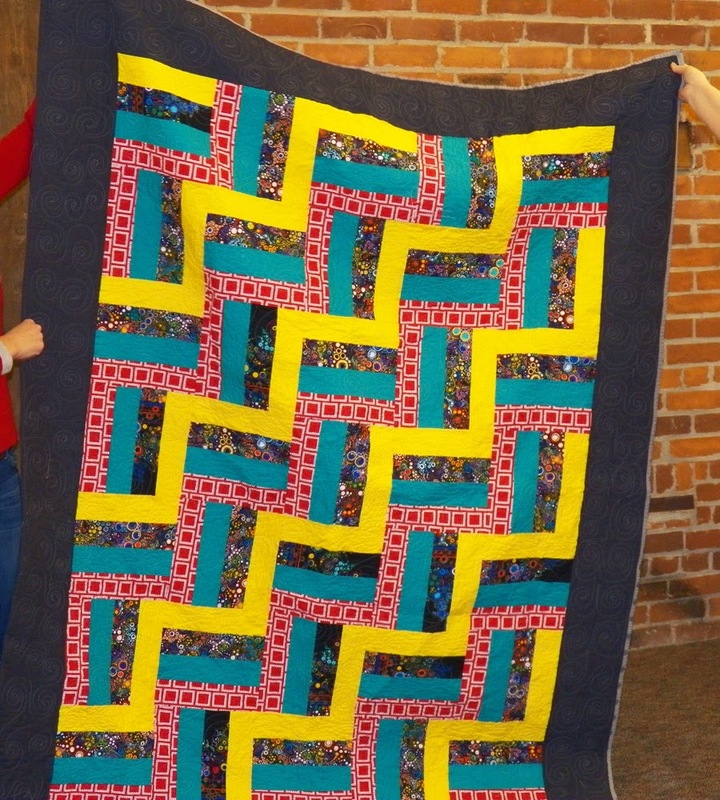 Any quilts finished after the November meeting will be donated to our next charity. 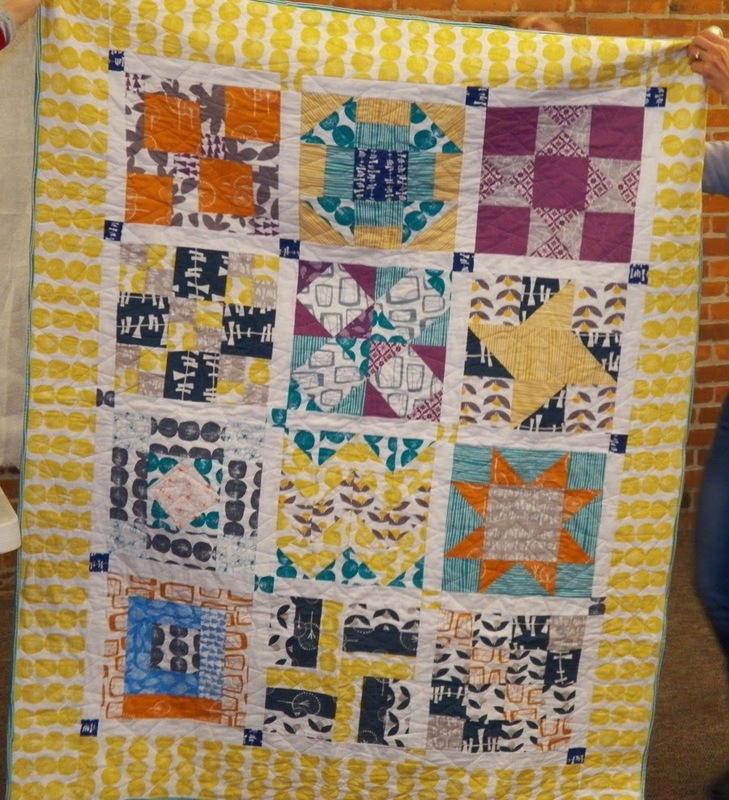 The total number of quilts donated for Project Linus from the Michael Miller fabric challenge was 15! Yay, guild! 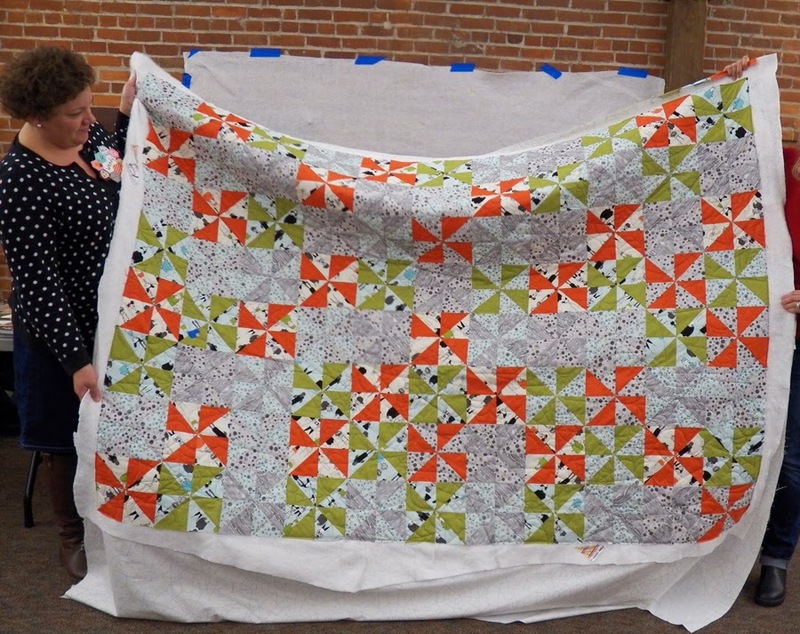 Traveling quilts: This is the last round for the traveling quilts. Be sure to bring the blocks you have to the November meeting. 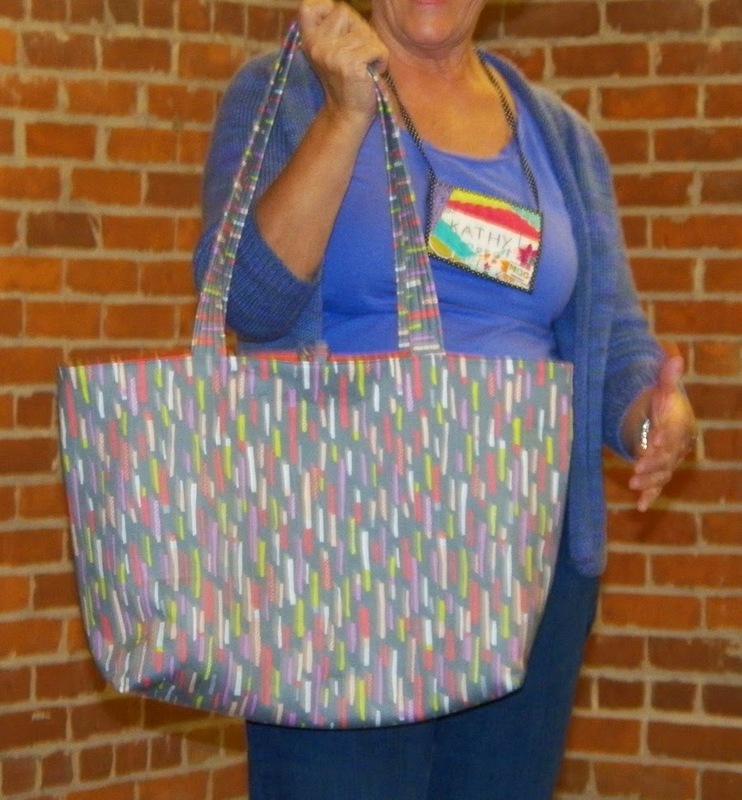 Participation prize: We'll be drawing for the next participation prize at the November meeting. Remember, you get participation tickets for attending sew-ins, signing up and bringing snacks, and showing projects at show-and-tell. 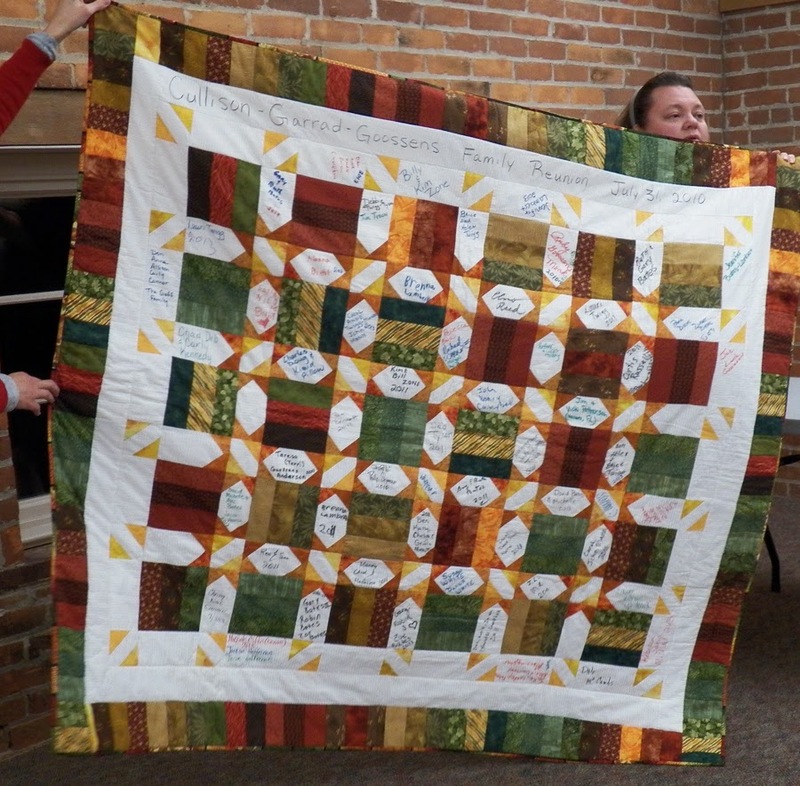 Traveling quilts 2: Sign up for the next round of traveling quilts at the November meeting. The next round will begin at the January meeting. Holiday swap: Sign up at the November meeting for the Annual Holiday Swap. For this swap, you will sign up at the meeting, and at the end of the meeting, you will receive the name of the person for whom you are to bring a handmade gift. All gifts will be swapped at the December meeting. December potluck: We'll have a potluck dinner at the December guild meeting. Sign-ups for food will take place at the November meeting. 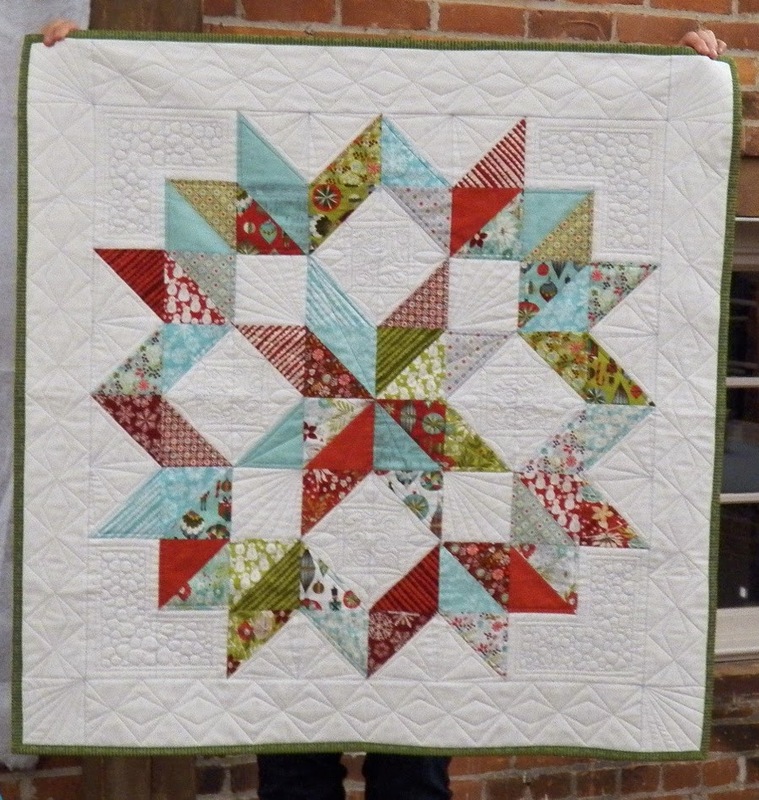 Amy made this baby quilt for a friend using her favorite backing fabric ever. 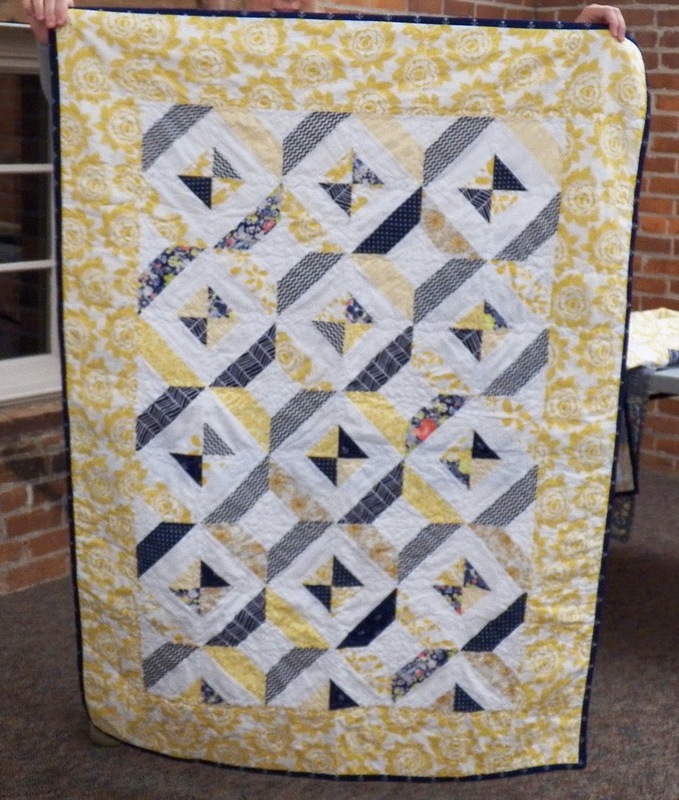 Amy's finished swap quilt (she received all the pieced blocks in various swaps). 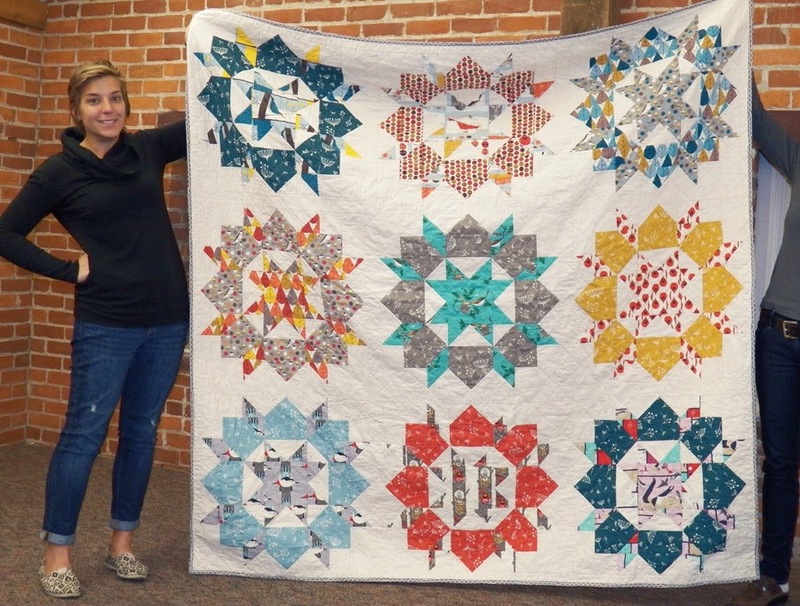 Carrie's finished Charley Harper Swoon quilt. 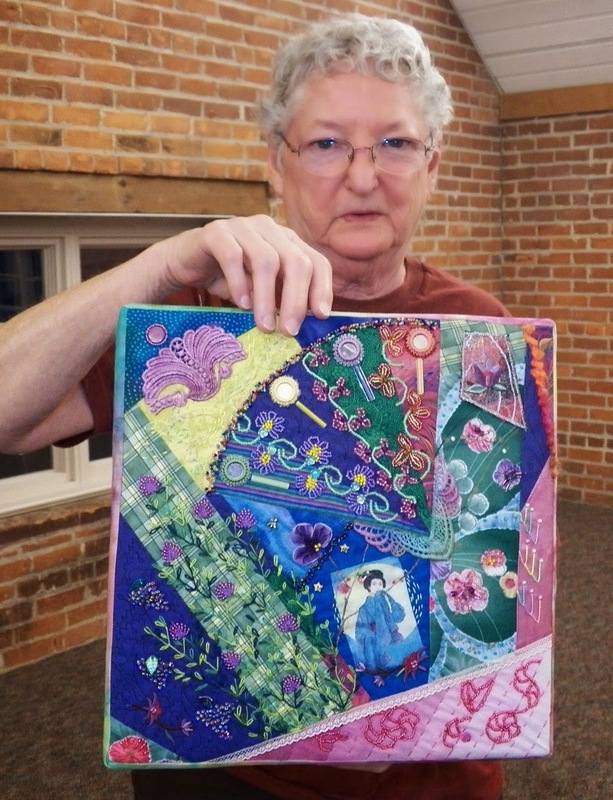 Carrie made this crazy quilt block for her contemporary quilt group. 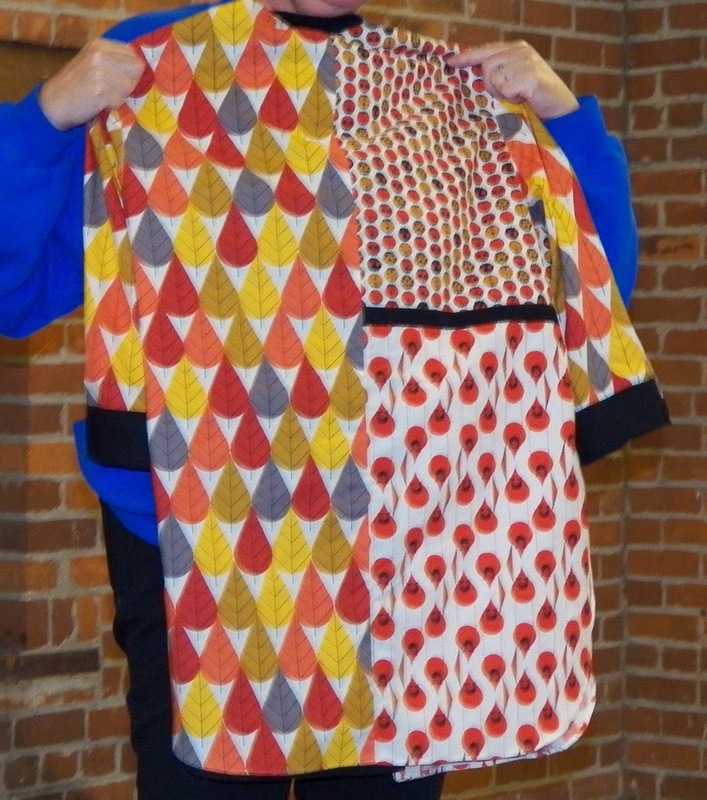 Carrie made this T-shirt quilt for her grandson using the quilt-as-you-go technique. 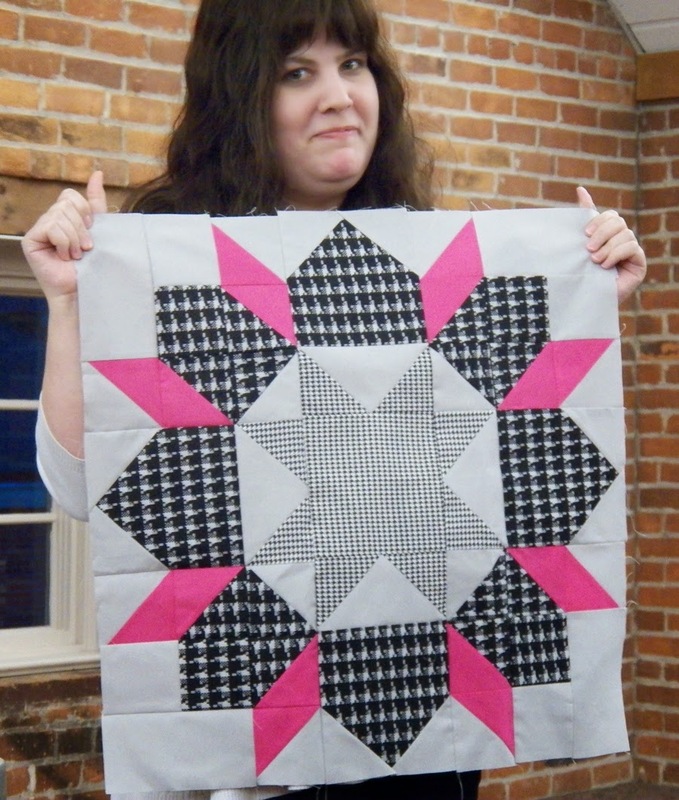 Cass made this quilt from a patten and ombre fabrics she bought at a One Stop Shop Hop. Christine's improv Churn Dash piece. Christine's string quilt made from a pattern in the book String Quilt Revival. 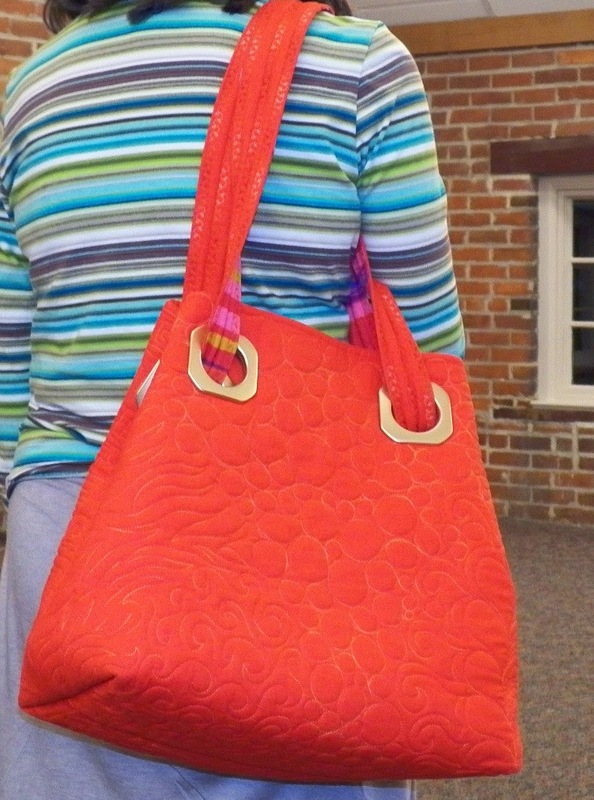 The bag Kathy made at the OH Craft sew-in. 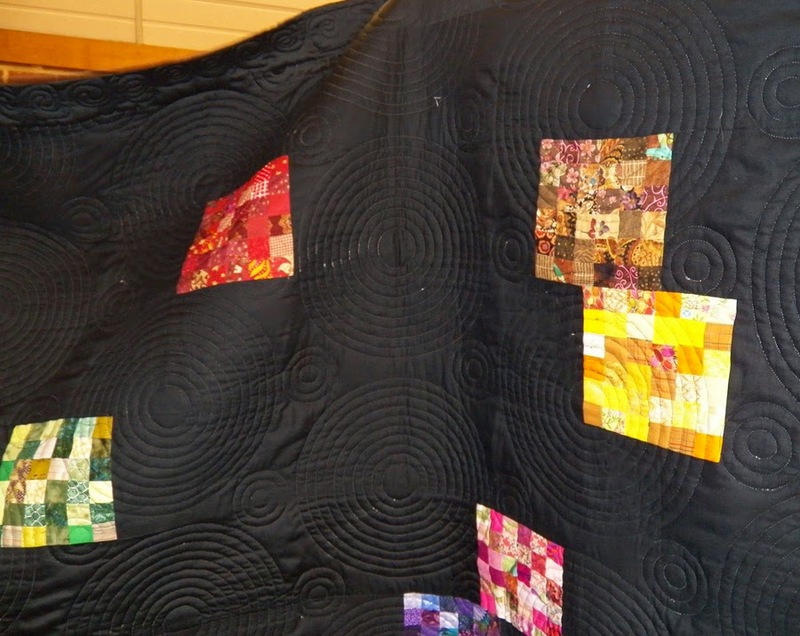 She quilted it with organic lines. String quilt Michelle made for her daughter using mostly scraps and fabrics Michelle was tired of. 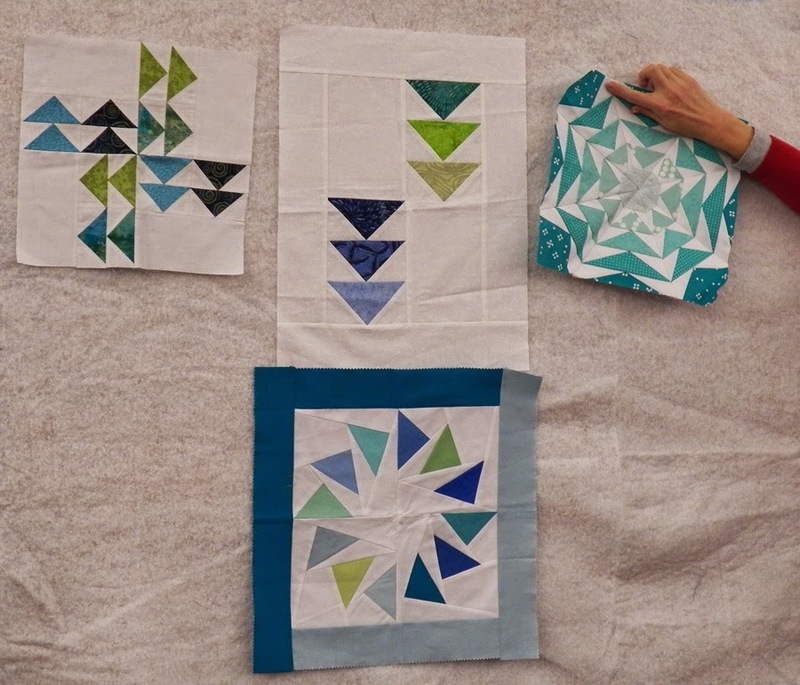 Pam is making blocks for a black and white Swoon quilt. 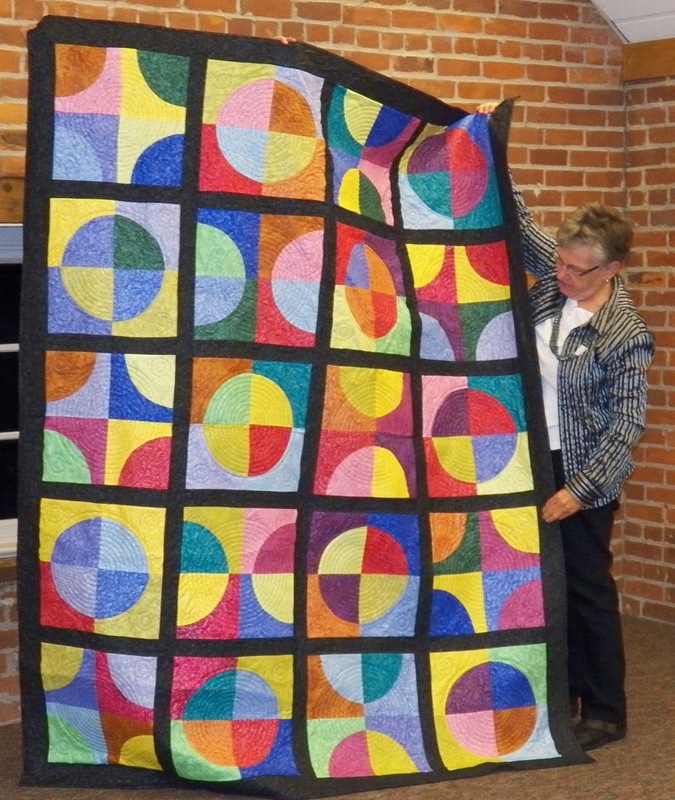 Sandy started this quilt with the idea it would be all circles, but after joining the CMQG she decided to mix it up. 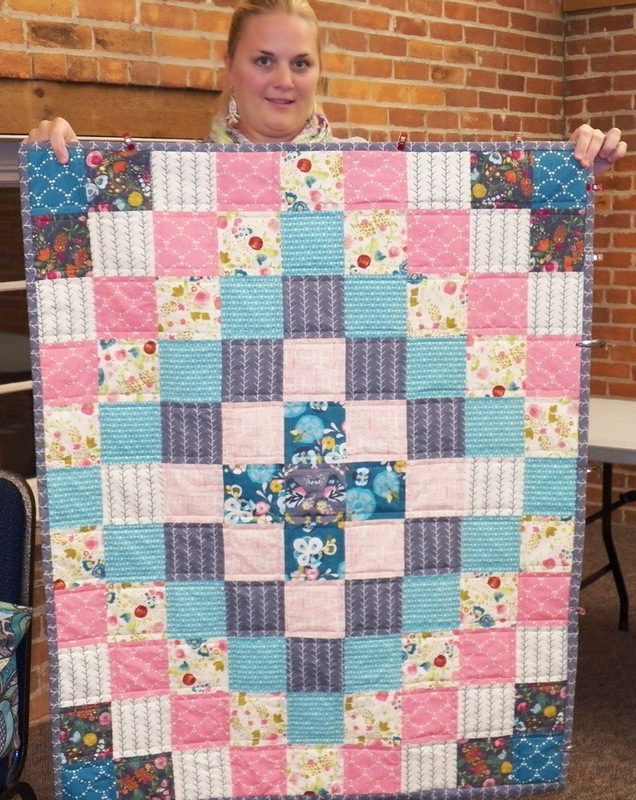 Sandy was inspired by the new Lucky Spool book to try straight-line quilting with a walking foot, and she loved it! 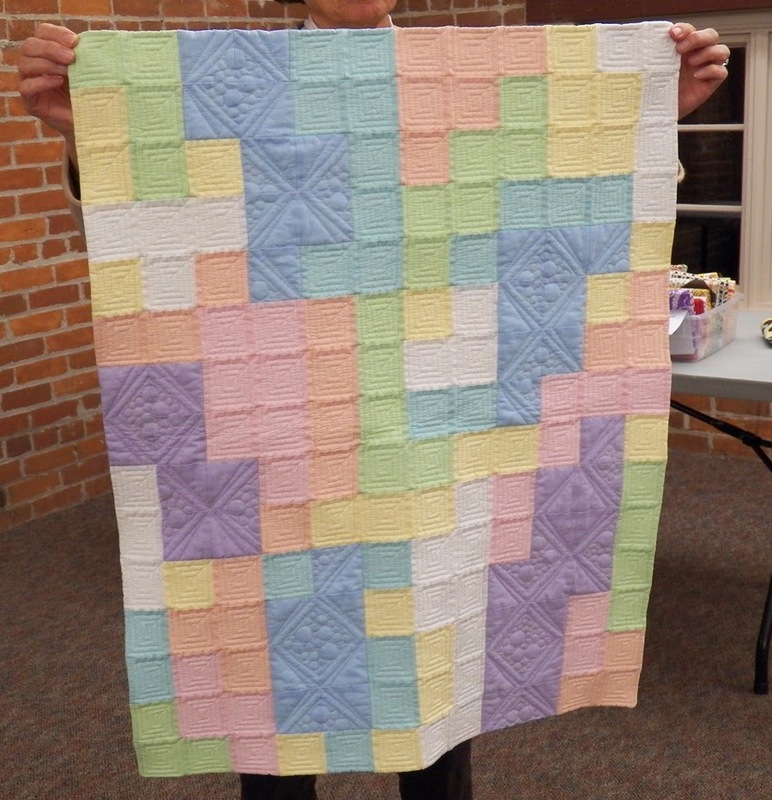 Sandy was inspired to make this paper-pieced wall hanging after the education session at August's meeting. 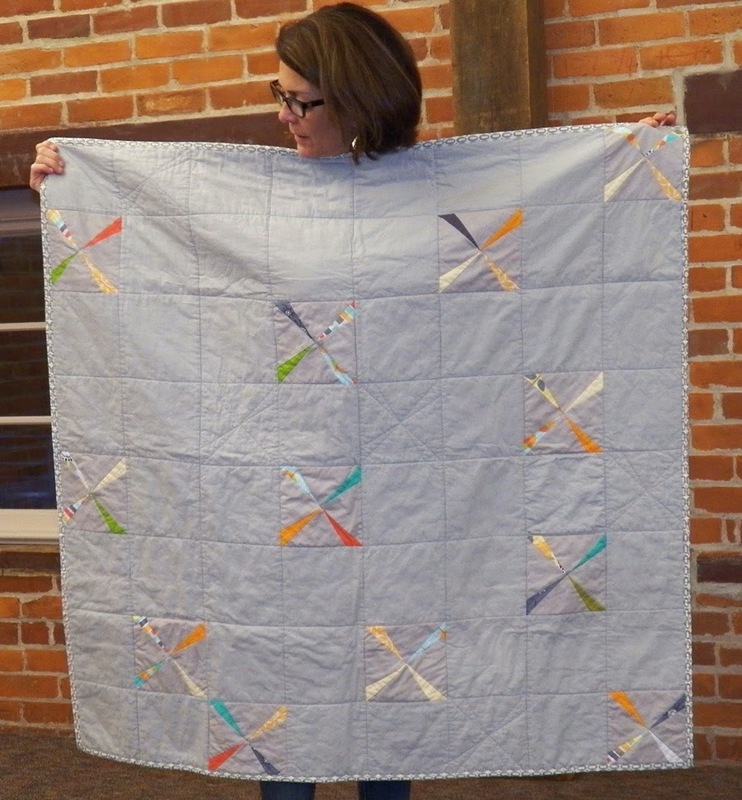 Sandy made this postage-stamp-inspired quilt to get rid of her fabric scraps. 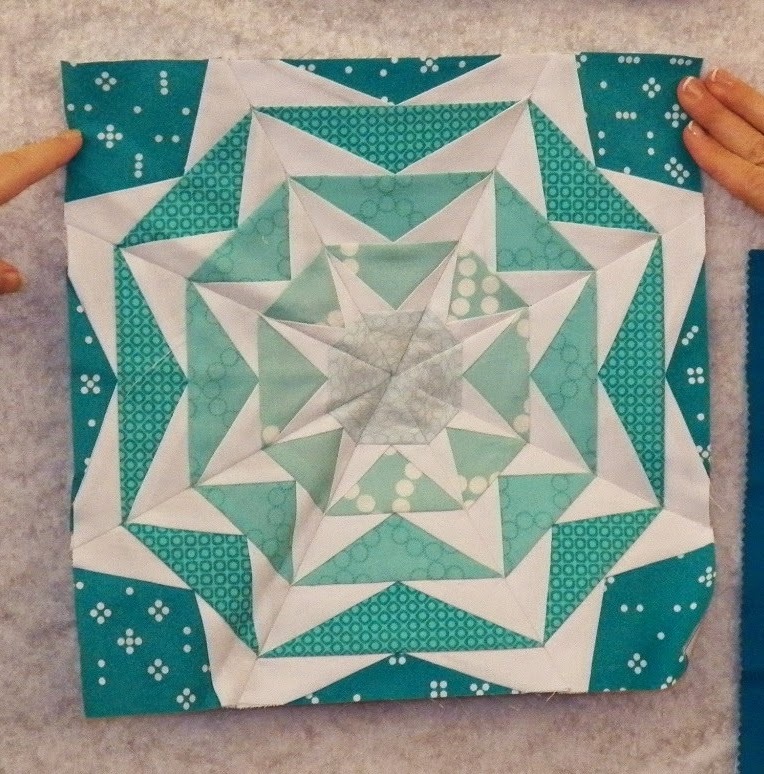 Harriet did the circular quilting. 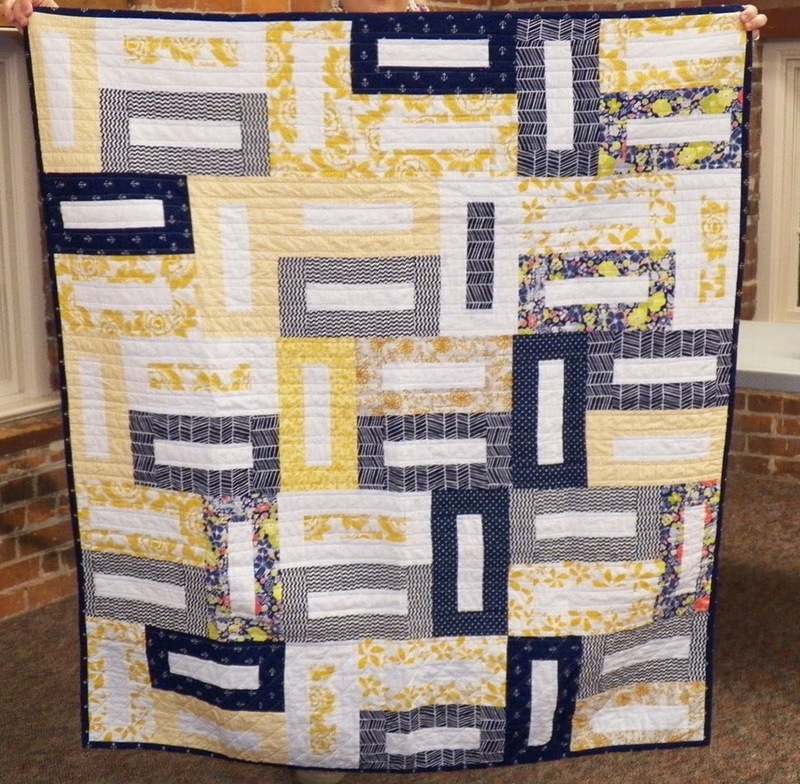 Teresa's finished Michael Miller challenge quilt. 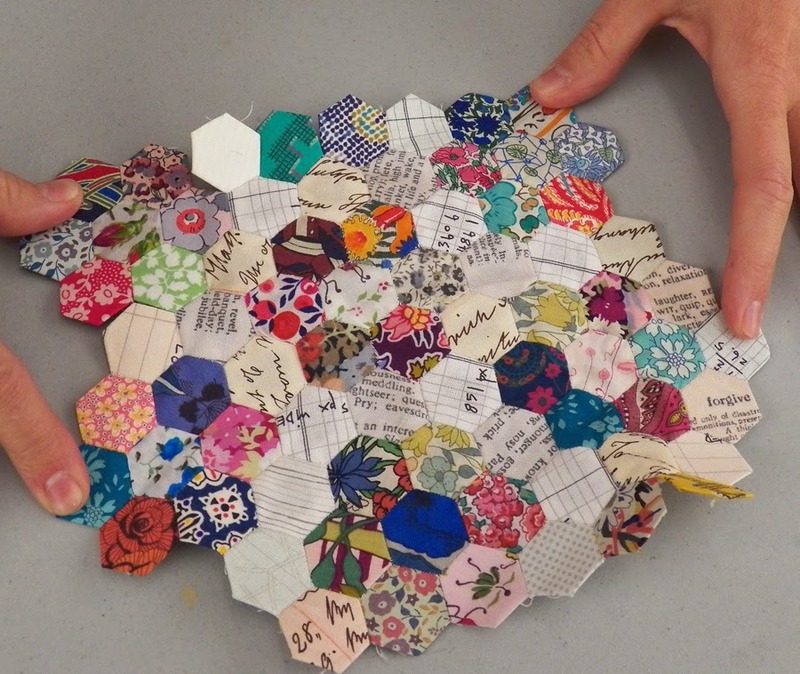 After the education program on hexie's at September's meeting, guild members were given the challenge to make a hexie project to show in October. 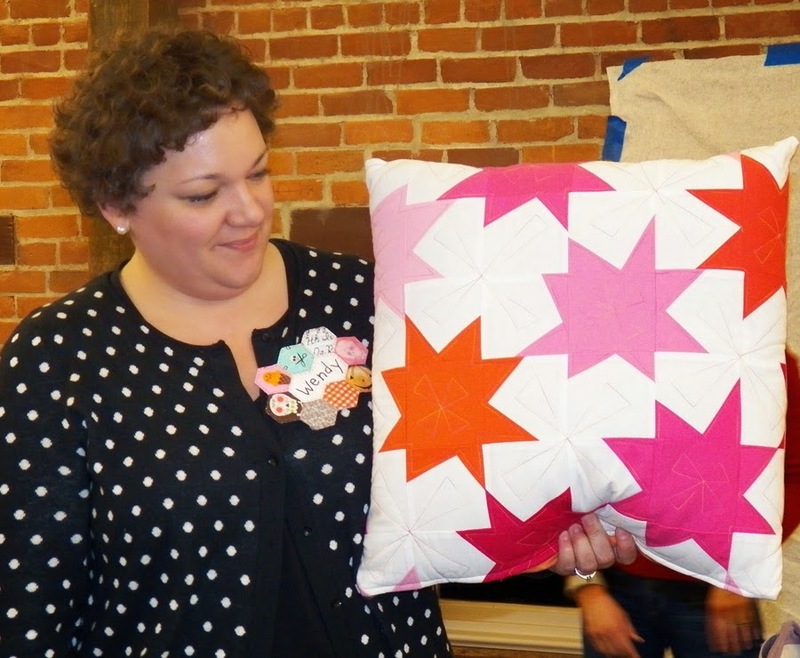 Annie made these hexie blocks to cover some stains in a fabric she's using to make a charity quilt. 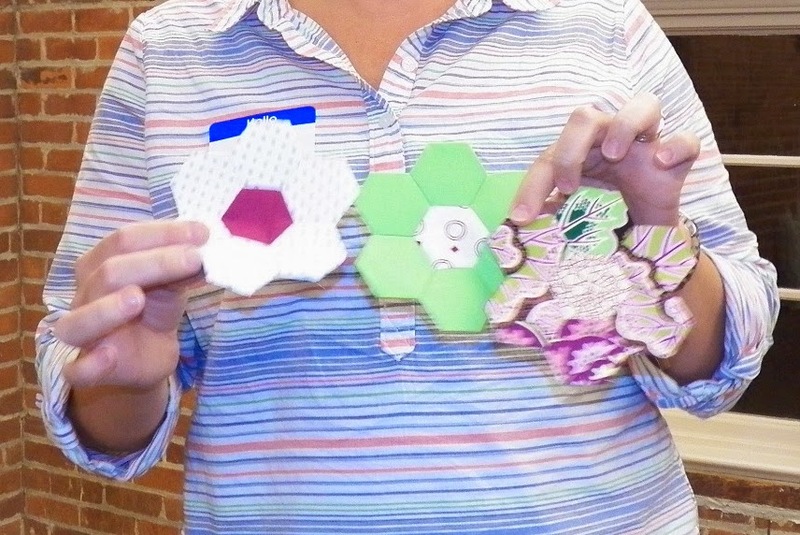 Carrie has been working on these mini hexies (1/2-inch each) using Liberty fabrics. 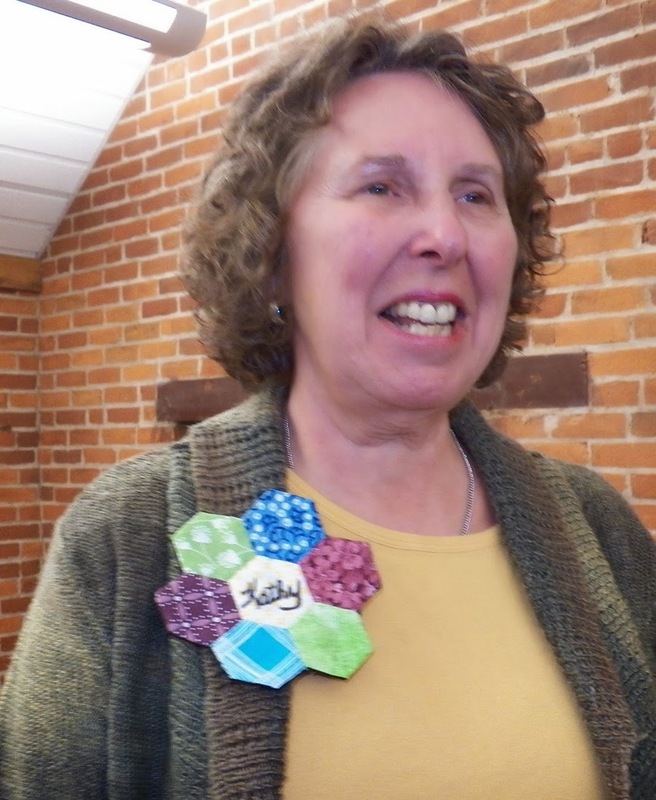 Harriet made a hexie nametag. As did Kathy, who is thankful her name is shorter than Harriet's. Ruth made a hexie bracelet. 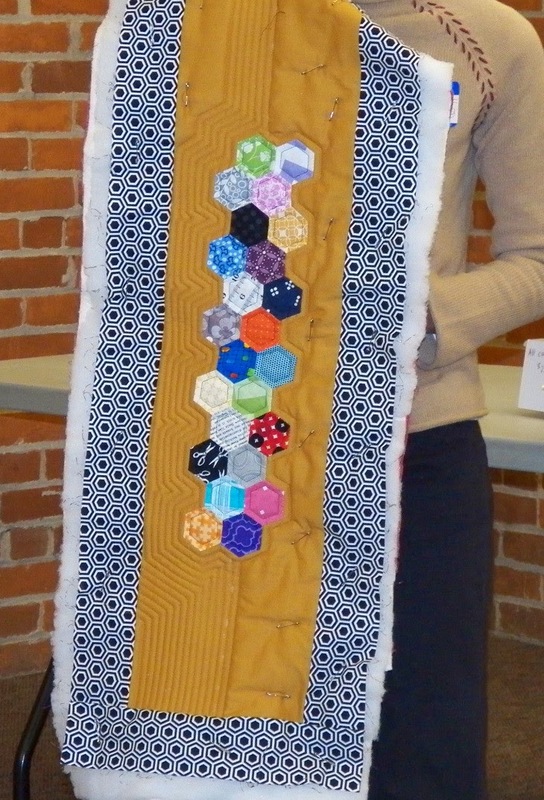 Sandy brought this hexie quilt that she made while working nights at a hospital. 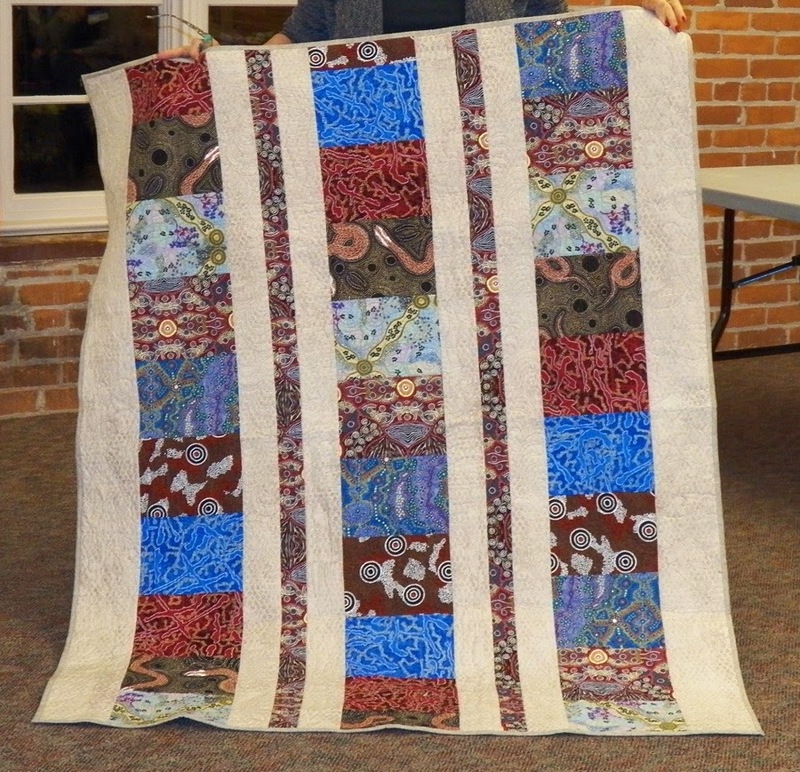 Harriet did the quilting. This month Brooke, our education chairperson, made a quilt-bag Bingo game for us to play. All the terms were things you would find in a quilter's project bag.